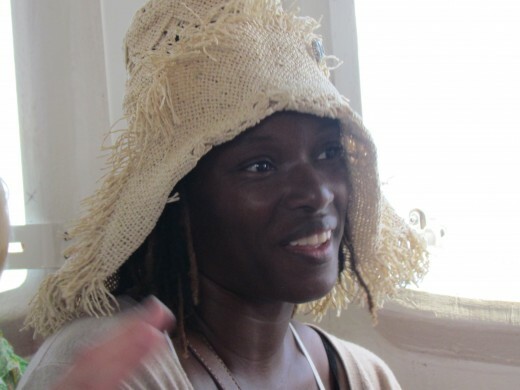 Claudette is inspired by positive thinking that she tries to share with as many people as possible to give them hope for the future. Pompeii Excavation tour which was one of our first tours. 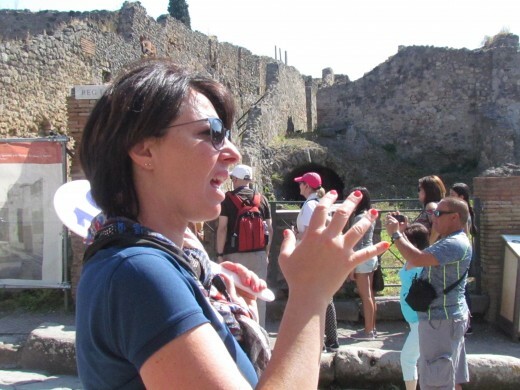 Adda, was our tour guide which she made informative and enriching about the ruins and the history of Pompeii. 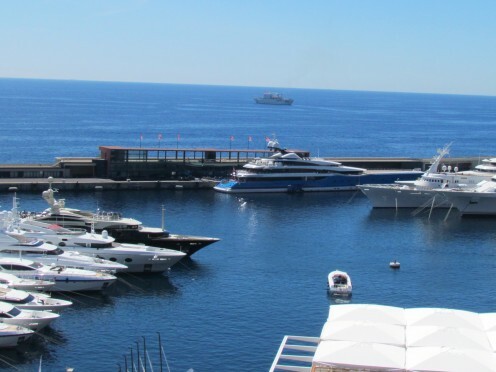 The beautiful port in Monte Carlo, around the corner form Hotel De Paris This port is described as one of the world's most picturesque locations. A quick photo from our bus of the beautiful Epic, Norwegian Cruise Line which we toured the Mediterranean on. 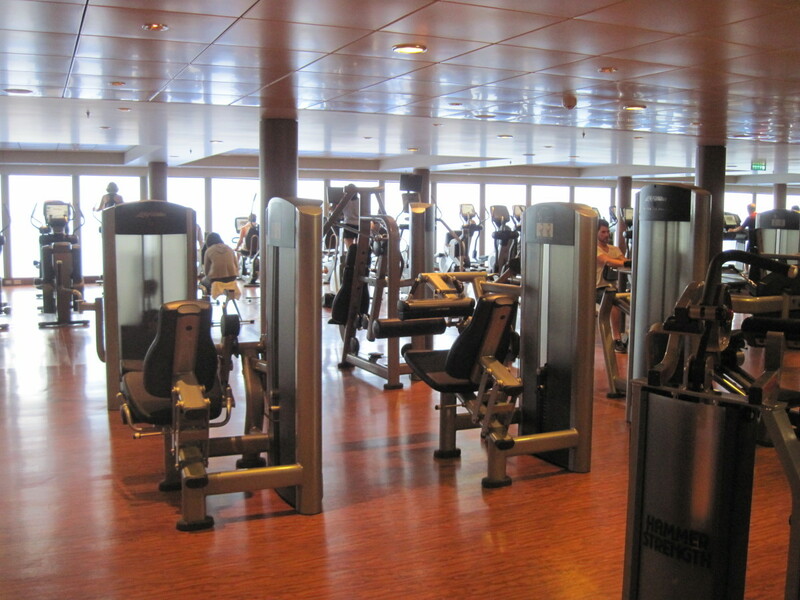 The interior of the Epic, Norwegian Cruise line. 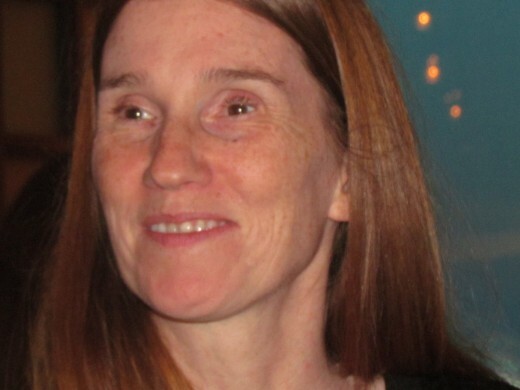 Note of Thanks: Angelladywriter, would like to thank her twin sister Paulette, husband Walker (now deceased) and various family members for helping her continue writing articles and producing photos during her injury for the past few months. 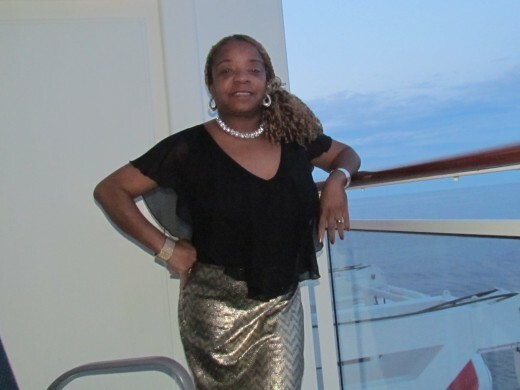 We would also like to thank Shavon May of Cruises Only for helping us plan this beautiful vacation for our 30th Wedding Anniversary. We humbly give thanks to our Grand Creator Jehovah God, for the privilege to see so many other beautiful parts of the world through a seven-night Western Mediterranean Cruise on Norwegian's Epic. 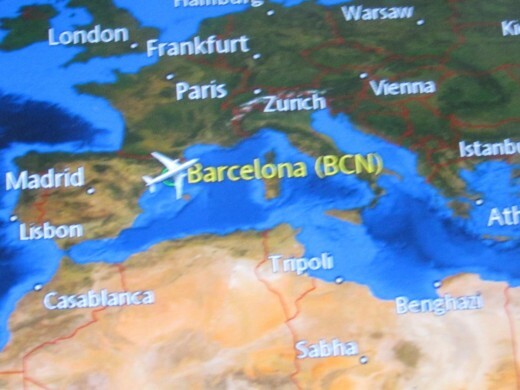 Our flight was on a Saturday, out of Newark, New Jersey which took a total of seven hours to #Barcelona, Spain which is about six hours ahead of our time. Upon our arrival in Spain, we decided to exchange our American dollars for #Euros. One US Dollar equals 0.89 Euro. 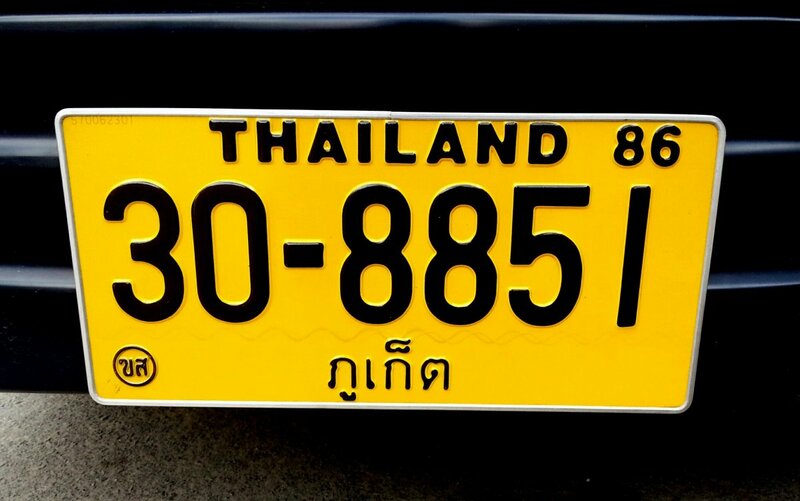 We had done research and knew that Euros, were vital for our expenses which included a taxi for about forty dollars from the airport to the ship. 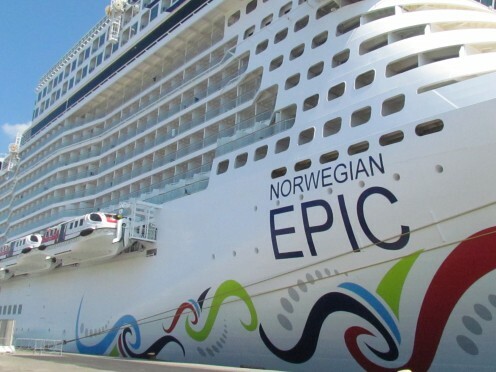 After numerous checks of our passports, starting from Newark's Airport to our arrival at the cruise line, we finally boarded the illustrious Epic of #Norwegian Cruise Line. 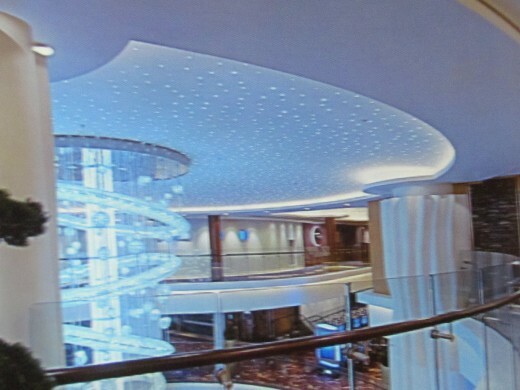 This ship was impeccably clean with embellished chandeliers, furnishings, restaurants, shops and staterooms. Tremendous anticipation filled our thoughts as we located our stateroom; this time with a balcony to begin our thirty year wedding anniversary celebration. 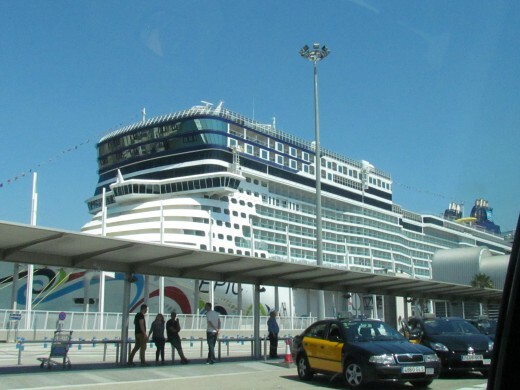 The Norwegian Epic, departed the port of Barcelona around 6:00 pm for our Mediterranean Cruise. We had planned and saved for this trip, although after my injury, we were not sure if our plans would come to fruition. Fortunately, the air travel was not too tricky and waters of the Mediterranean were smooth and not choppy or disheveled like they might be during an ocean cruise. We thanked our Heavenly Father for the calm waters daily. 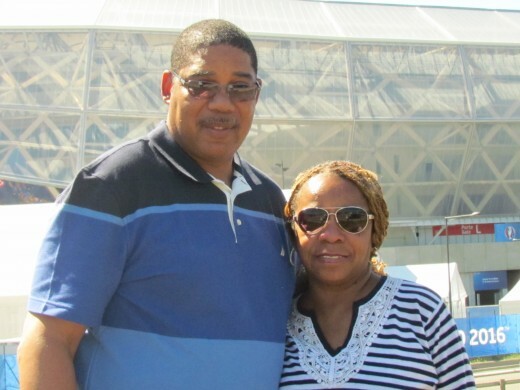 Many may think that this trip was costly but after thirty years of marriage and the fact that we had never been to Europe as a couple; we prayed and decided to do something special for ourselves. Thankfully, after numerous prayers to Jehovah God, we were able to pay a total of $2,400 per person in installments. For this seven-night Mediterranean Cruise which included nonstop roundtrip airfare on United Airlines, from Newark, New Jersey to Barcelona, Spain. We took the time to shop around for airfare which was lower by not booking the cruise and airfare together at the same time. We booked the cruise through CruisesOnly, at the beginning of the year which also caused the prices to be a little more reasonable. The search engine and computer savvy person can easily get these prices even at a lower rate. Thirty minutes from the port was the Pompeii Excavations. 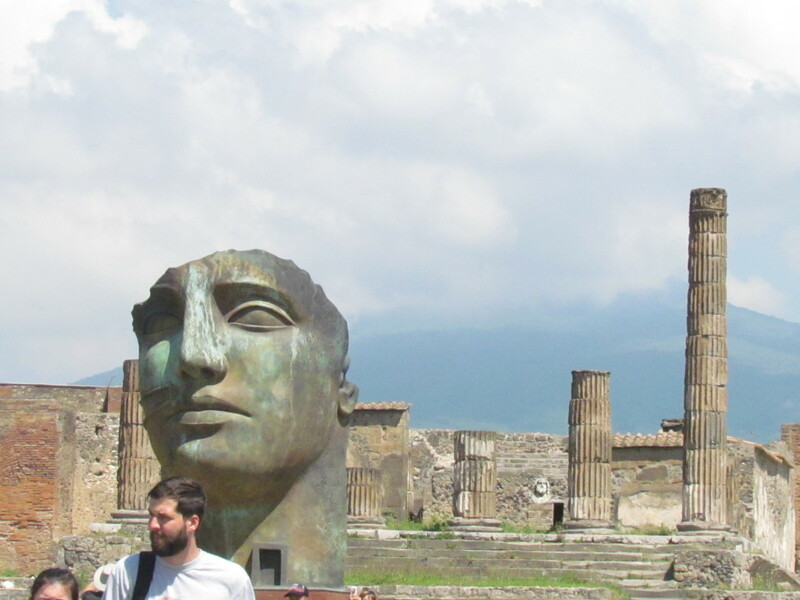 This is one of the large sculptures we viewed during our tour of the Archaeological Areas of Pompeii. Our first stop in Naples was a museum with amazing art and other merchandize for sale. Another beautiful sculptured piece that was displayed in the museum before our tour of Pompeii Excavations. 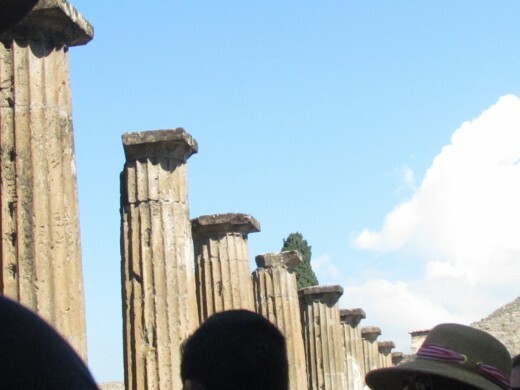 Ruins of columns within the Pompeii tour. This Roman city was destroyed and buried under volcanic ash and pumice in the eruption of Mount Vesuvius in AD 79. 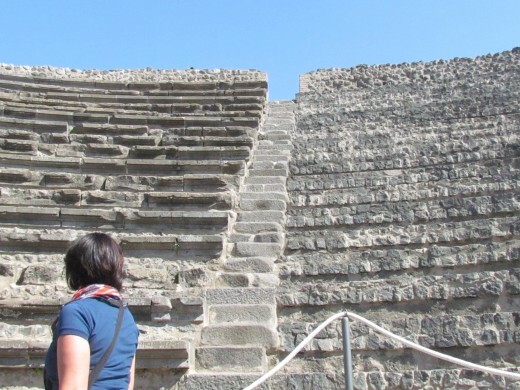 When Pompeii, was destroyed its population was estimated at 11,000 people and the city had a complex water system, an amphitheater, gymnasium, and a port. Adda, was our very knowledgeable tour guide for the Pompeii Excavations. 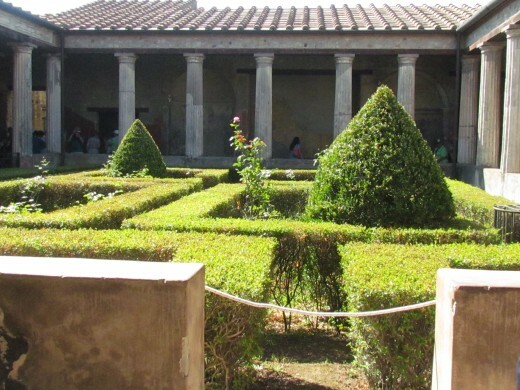 The remains of what was once beautiful courtyards within Pompeii. Today the courtyards are covered by green grass and manicured bushes. An example of what the streets were like in Pompeii where spaces were left between the rocks for the wheels of Roman chariots. 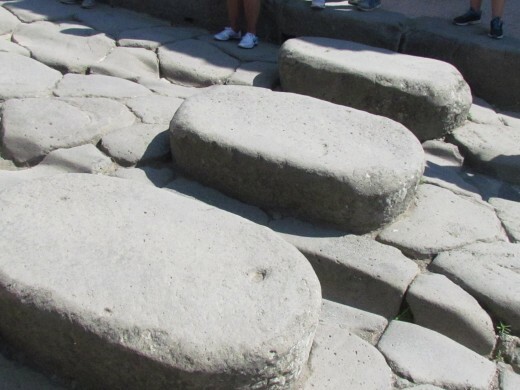 They also had rocks and stones for stepping to avoid animal excrement as the horses pulled these chariots. 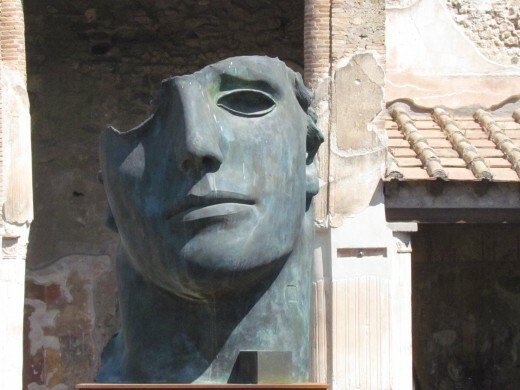 An interesting sculpture from the Roman period that was also in the Pompeii tour. .Arched columns covered in marble was the style of what some of the living areas were like. Running water, saunas, bathhouses and spas were a part of the Roman culture as proven during our tour of ruins in Pompeii. 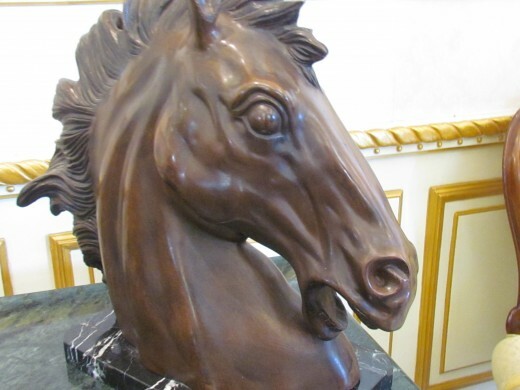 Sculptures with man and beast concepts were on display during our tour. 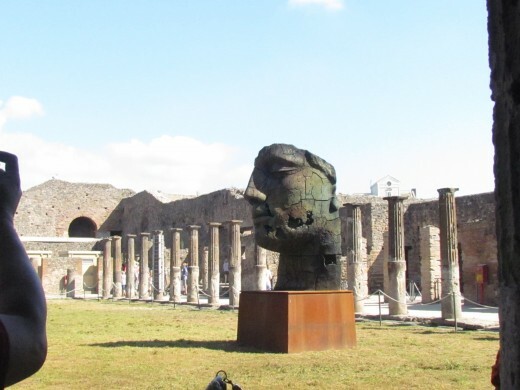 Gigantic sculptures of Roman leaders were also displayed during our Pompeii tour. A mold of a person that was killed when the volcano erupted and Pompeii was buried in ash after the catastrophic eruption of Mt. Vesuvius in 79 C.E. 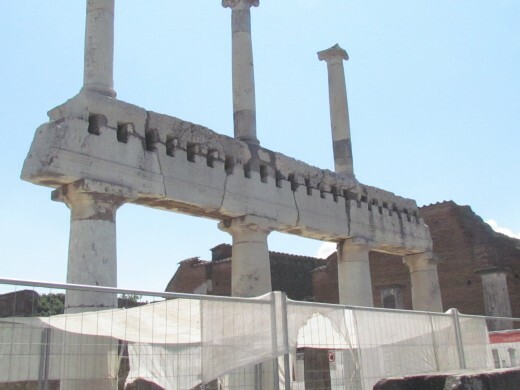 High columns still remain within the Pompeii ruins from the Roman era. 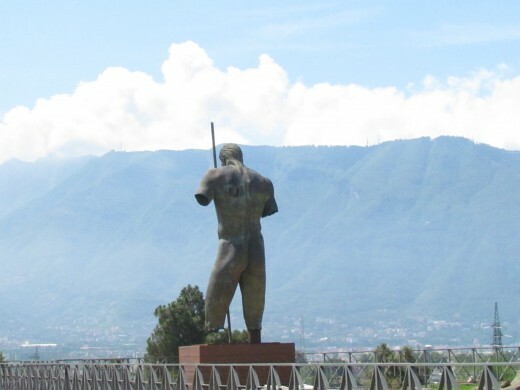 Tall statues loom over the devastated area of Pompeii. Another sculptured figure that was displayed at the end of our tour in Pompeii Excavations. One of the locations we stopped at after our tour. 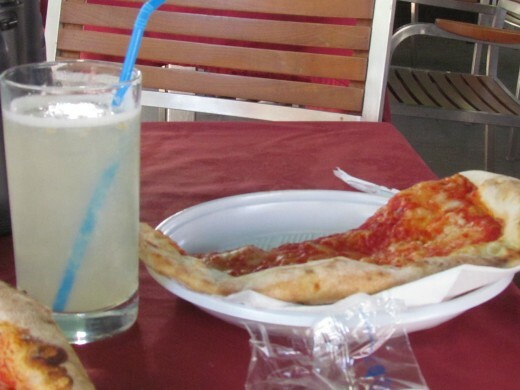 We ate Italian styled pizza and had a frosty like beverage before returning to our bus at the end of our tour in Naples, Italy. 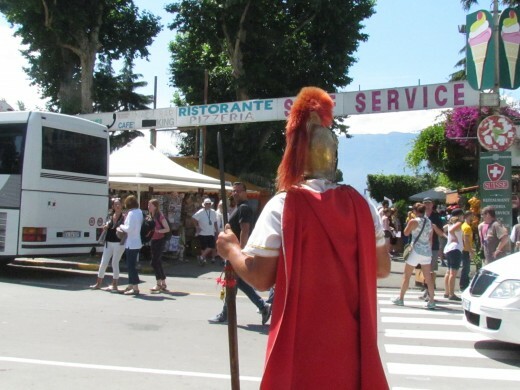 A man dressed as a Roman Army Officer, stood in the square where various shops were in Naples. 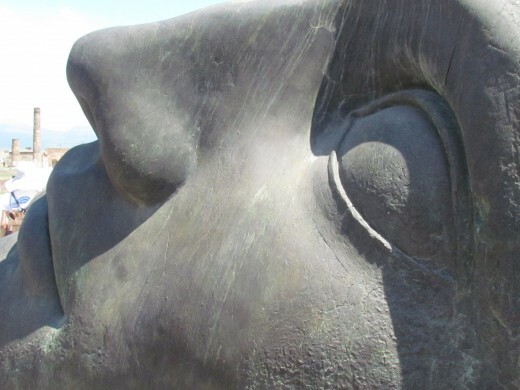 An up close look at one of the sculpted figures within the Pompeii tour. 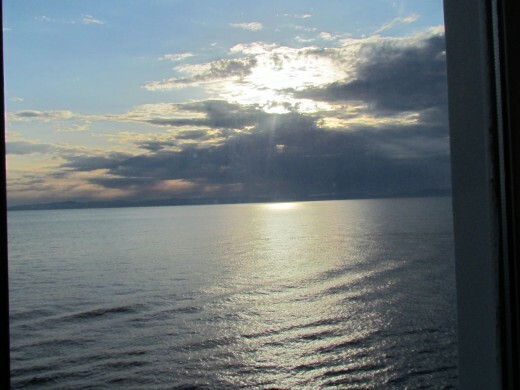 A photo taken from our balcony on the ship before we entered Naples, Italy. 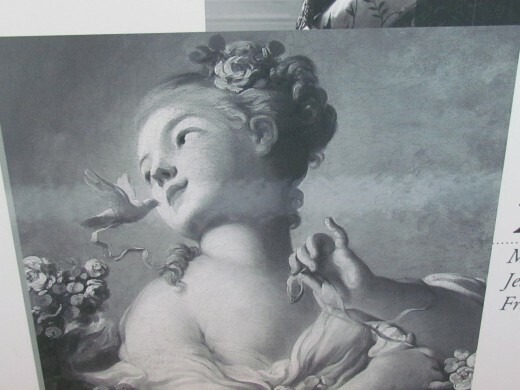 One of the art pieces that was displayed in the museum in Naples, Italy. 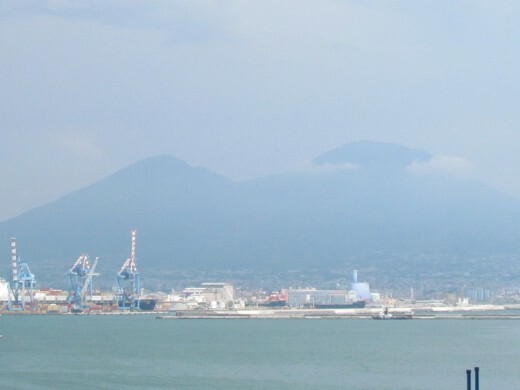 A photo of Mount Vesuvius which erupted around 79 CE near the coast of the Bay of Naples, where visitors can see where the destruction of Pompeii occurred and its ruins that remain today. A facial structure within the excavations where a tourist grabs a quick photo. 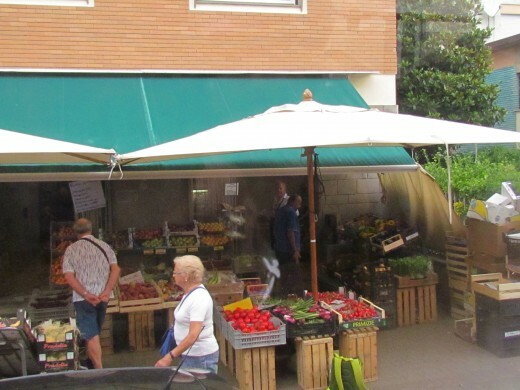 Fruits and vegetables were available for tourist with the city of Naples, Italy at various shops. Ruins of the amphitheaters in Pompeii where thousands would gather for entertainment. Inside of a very elaborate Roman home where marble and carefully crafted designs were displayed. The remains of a fountain that was displayed within the courtyard of a home. 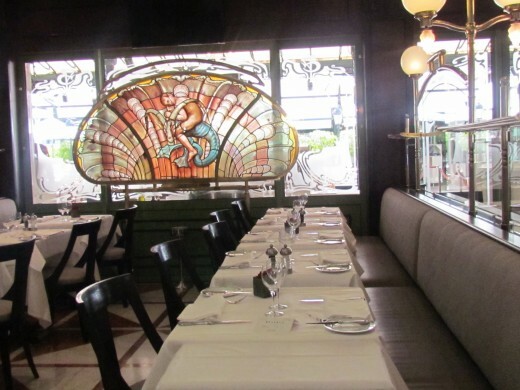 Interior photo of Le Bistro Restaurant. The best French restaurant. 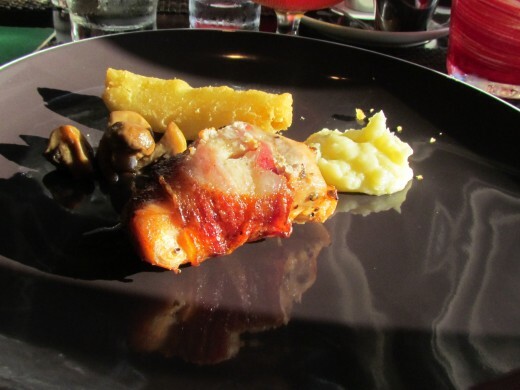 The food was amazing and the service was outstanding. 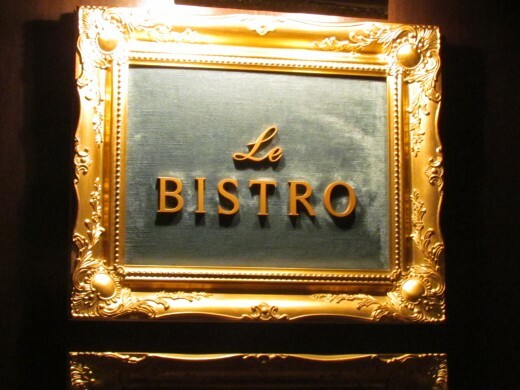 I would easily five Le Bistro, five stars out of five. It was perfect setting for our anniversary celebration. 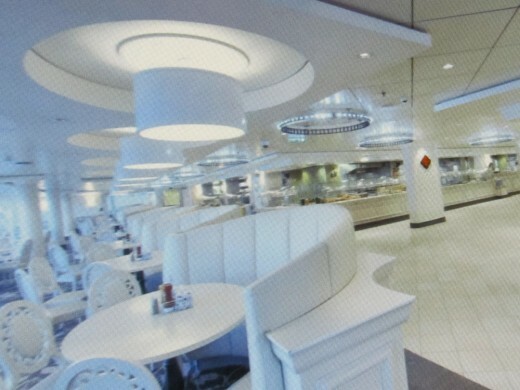 The Garden CafÃ© which specializes in American style buffet type of food. The food was pretty good. The beautiful Epic Theater, where top Broadway like performances were presented such as "Burn the Floor," which originated from Broadway in New York. This show is a must see as well. This lounge was our very favorite. We enjoyed drinks delicious drinks with the very hospital staff. This lounge was comfortable with sofas, chairs and even an area designated for cigar smokers. The interior of what our room was like with a balcony. This room was not only beautifully decorated but there was an abundance of storage space. We felt truly accommodated as we woke up in the morning able to see the magnificent locations. 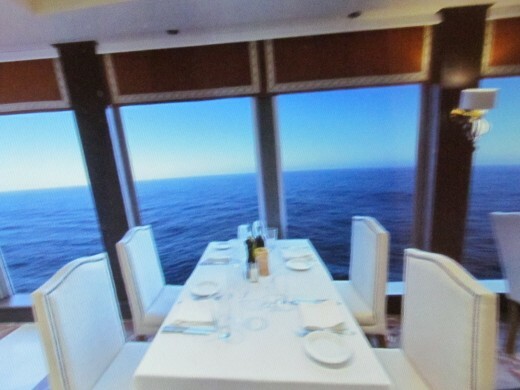 On Monday, after the luxurious Epic Cruise Line, left the port of Barcelona, Spain on Sunday; we enjoyed our first freestyle dining option at the Manhattan Supper Club on Deck 6. We dined on delectably fried calamari as an appetizer, sirloin steak, roasted pork loin, with sides of vegetables and snickerdoodle pound cake with vanilla ice cream for dessert. Our table for two positioned near the spectacular two-decked, floor to ceiling windows. After drinks, we retired with excitement for the planning of our tours during our first day at sea. This gave us the opportunity to explore the ship. 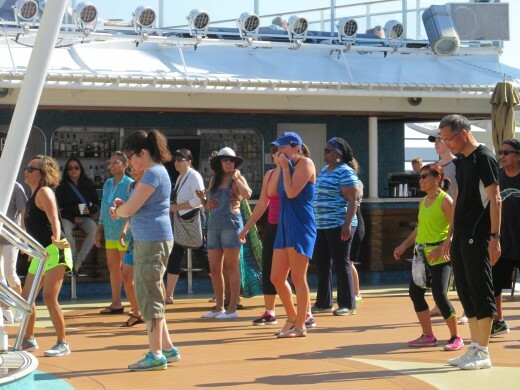 On Monday, while at sea, we enjoyed such activities as Bowling, Poolside Music with a DJ, while we consumed our delicious breakfast at the Garden Café Buffet. We arrived at our first port on Tuesday. 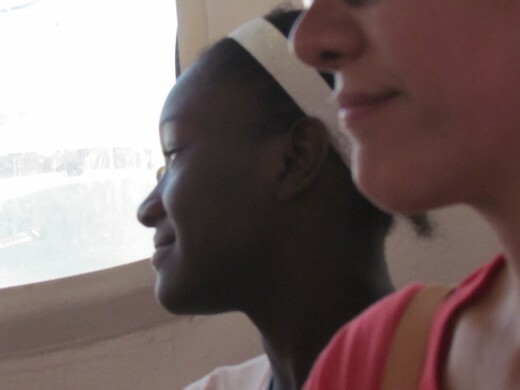 During the night we sailed and arrived at the port of Naples, Italy around 7:00 a.m., that morning. 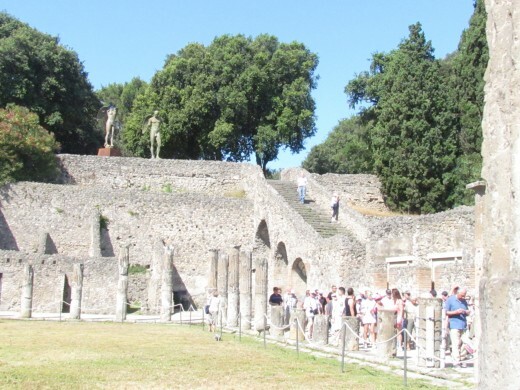 Previous guests highly recommended the #Pompeii Excavation tour. 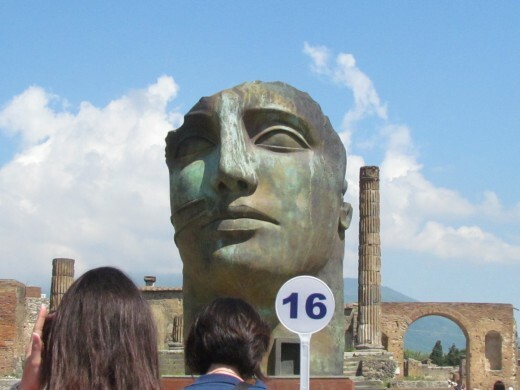 "Pompeii is a vast archaeological site in southern Italy's Campania region. Once a thriving and sophisticated Roman city, Pompeii was buried in meters of ash and pumice after the catastrophic eruption of Mt. Vesuvius in 79 C.E. 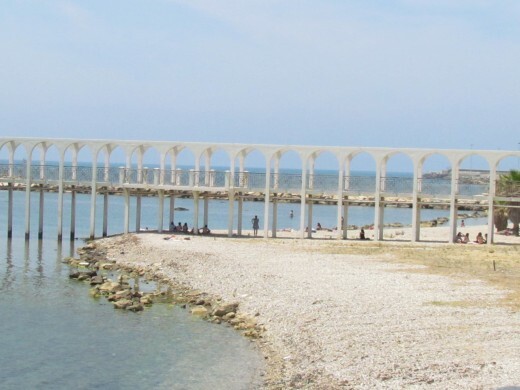 Near the coast of the Bay of Naples, the site features excavated ruins that visitors can freely explore," stated Wikipedia. Our interest peaked after the 2014 movie entitled, Pompeii, where a Roman Senator played by Kiefer Sutherland, fought against Kit Harington, a slave who was also a gladiator. The two battled for the love of the same woman Emily Browning, as the destruction of Pompeii surrounded them from the eruption of Mount Vesuvius. 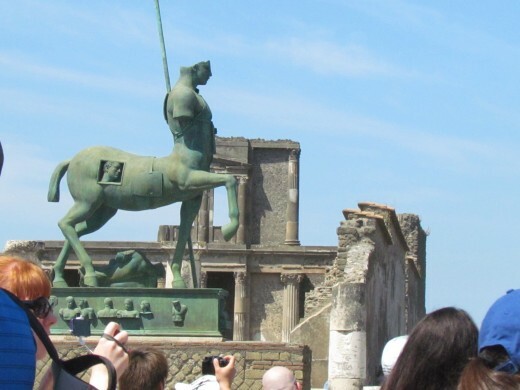 The intrigue of Pompeii consisted of a tour of various Roman ruins which involved towering statutes, elaborate remains of homes, businesses, brothels, rocky stoned streets where chariots once maneuvered, bathhouses and spas. Our well-informed tour guide Ada astutely shared historical points about this once enriched city that buried in more than 30 feet of ash which lasted two days in 7980. 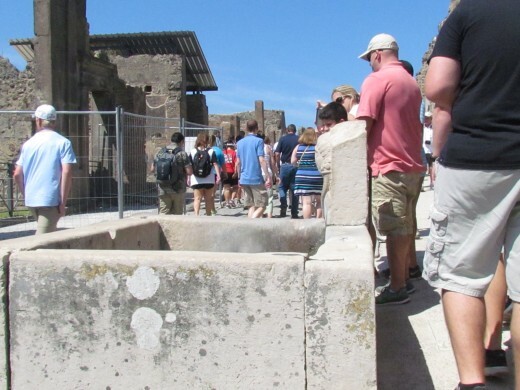 Her descriptions helped tourist to see the dissipation of Pompeii 's previous residents. They could have easily spent their days within their marble encased walls, eating fresh baked bread and cakes from their local bakery. 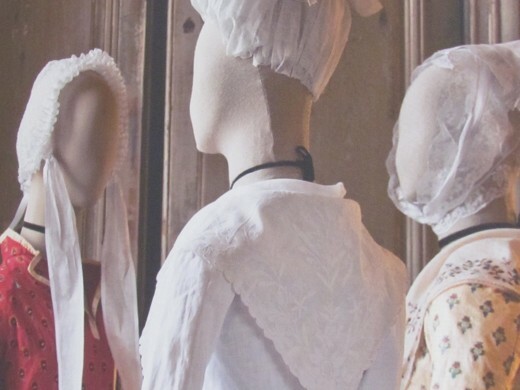 Daily they would visit their copious bathhouses with running water, swimming pools, saunas, and changing rooms were available for both women and men. An article in The Watchtower magazine of January 1, 2003, made this comment about the city of Pompeii, "In the first century of our Common Era, Pompeii and Herculaneum were two prosperous Roman cities situated in the shadow of Mount Vesuvius. For wealthy Romans, they were popular resorts. Their theaters were capable of holding audiences of over a thousand, and in Pompeii, there was a large amphitheater that could seat almost the entire town. 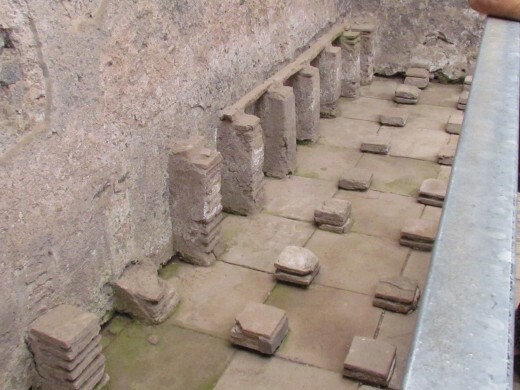 Excavators of Pompeii have counted 118 bars and taverns, some of which served as houses of gambling or prostitution. 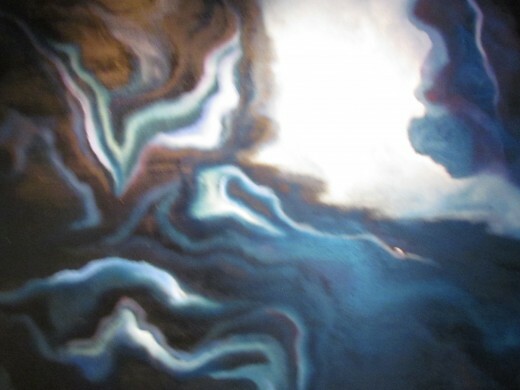 Immorality and materialism were rampant, as wall paintings and other remains testify." 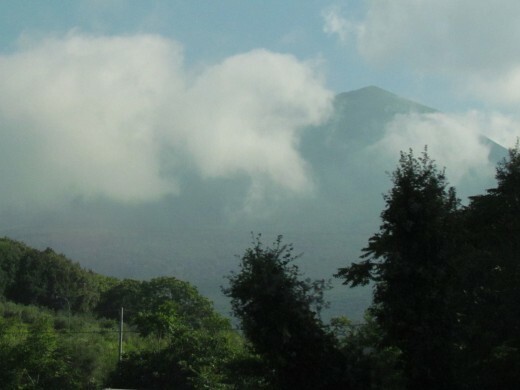 This #Watchtower article explicitly discussed how Volcanologists discovered that on August 24, 79 CE, the first eruption occurred from Mount Vesuvius. A clear warning for the surrounding inhabitants of Herculaneum and Pompeii. Some residents did flee but many did not. Tragically, those that remained in these areas lose their lives in the downpour of superheated gases, pumice, and rocks. "During the excavations, plaster was used to fill in the voids in the ash layers that once held human bodies. 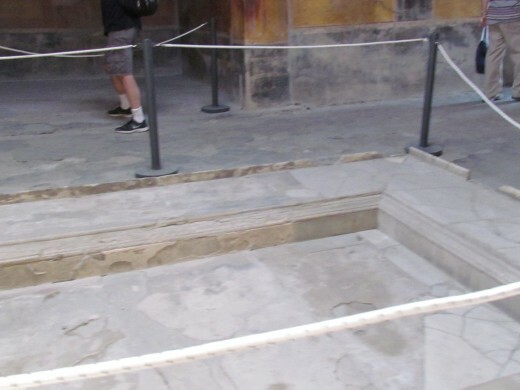 This allowed one to see the exact position the person was in when he or she died," mentioned Wikipedia. Warnings were given beforehand about the danger of this volcano. Do we adhere to similar warnings we receive today? Our tour guide Ada also reminded us of the negative aspects of Pompeii, such as the abundance of brothels. Prostitution was not illegal and accepted by the Romans. 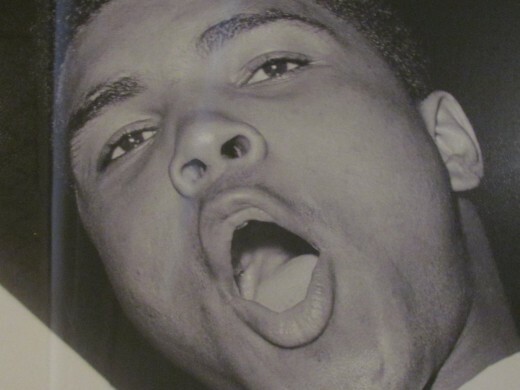 "The Roman empire wanted prostitution because they paid taxes and they had a high income from the prostitutes." This was one of the major attractions of Pompeii. 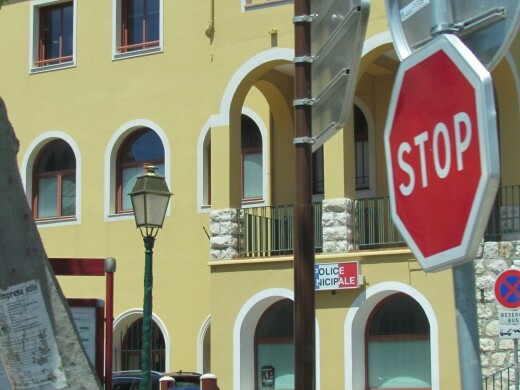 Additional information shared about the poorer residents of the city. "People who could not pay for water came to the fountains. The fountains where they would place their hands. 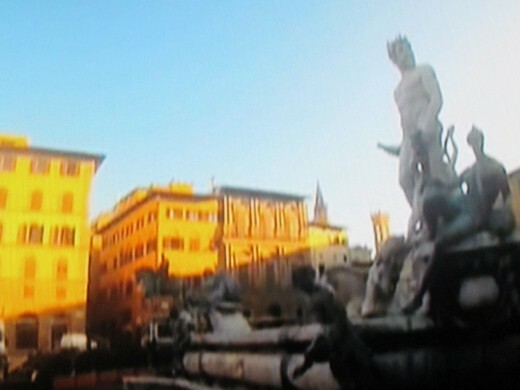 People used the relief of the fountain to get information." There was an abundance of information shared concerning this once wealthy city of Pompeii. 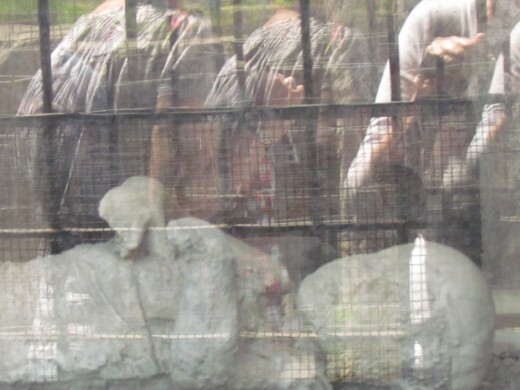 "You need seven days to see excavations. One part of the city still buried under ash," explained Ada. 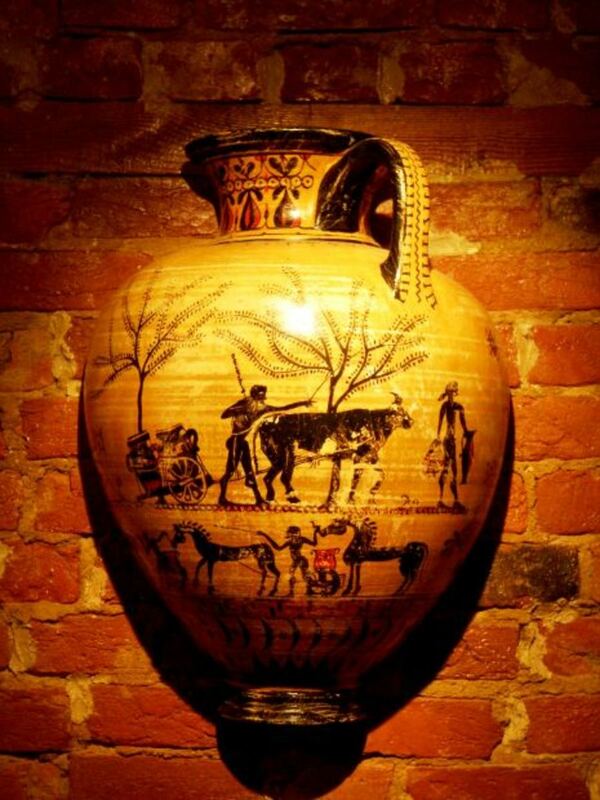 Archaeological excavations began in the 1700s. 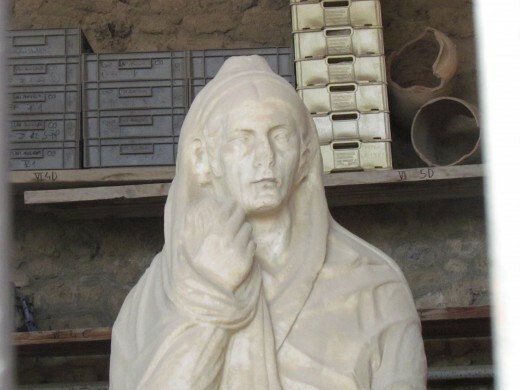 She also explained, "We are restoring Pompeii, no excavations but restorations." Ada, talked about how "buildings were covered in marble because this was a rich city, frozen in time." 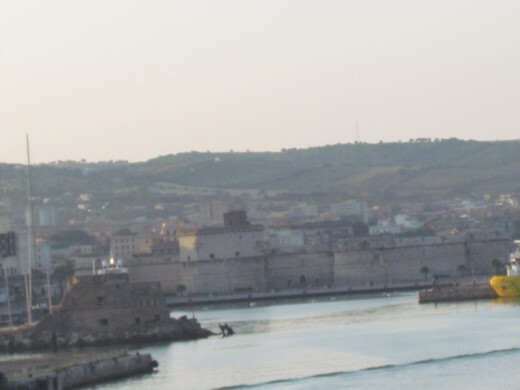 The spectacular Civitavecchia (Rome), Italy was our second port call which we arrived at on Wednesday. 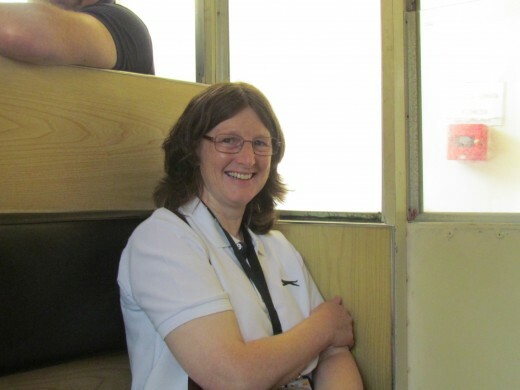 We took a bus from the ship to downtown Civitavecchia, Italy. Remnants of this castle was the first thing we saw before entering the town. The beach area near the restaurant where we had lunch. 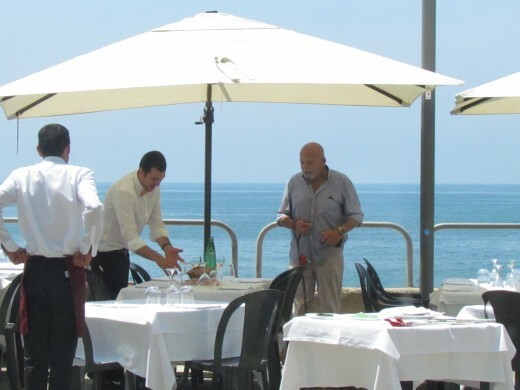 We ate lunch at Caprasecca Al Mare Ristorante, downtown Civitavecchia. 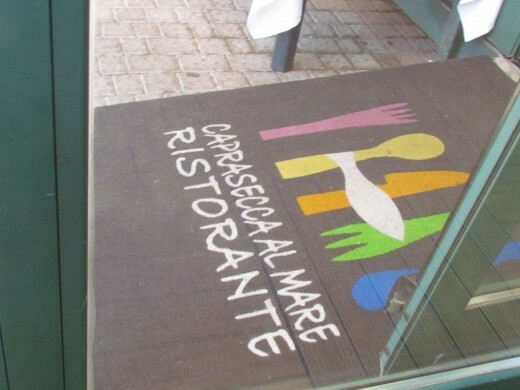 The welcome mat for ristorante. 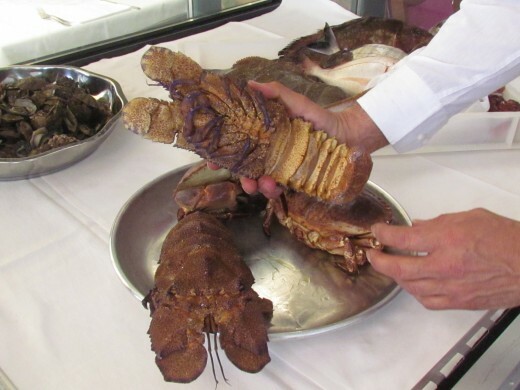 Fresh lobsters were delivered to Caprasecca Ristorante in preparation for dinner. 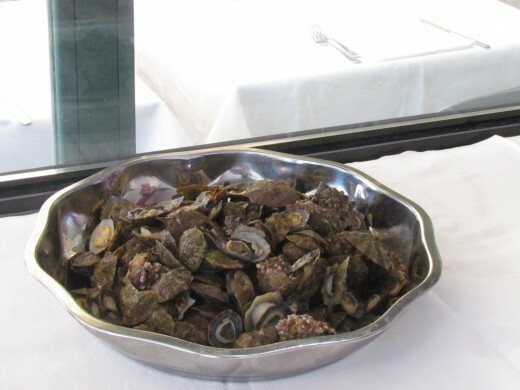 Fresh mussels and clams are also delivered daily. 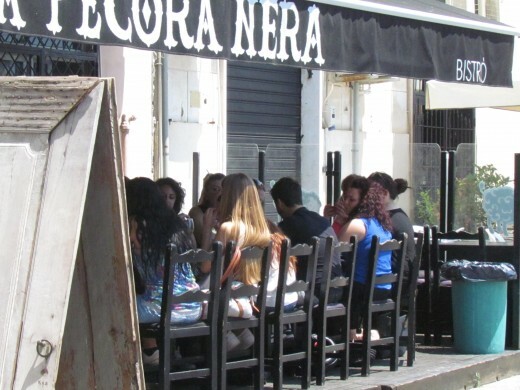 Some of the customers ate lunch on the patio of the ristorante. 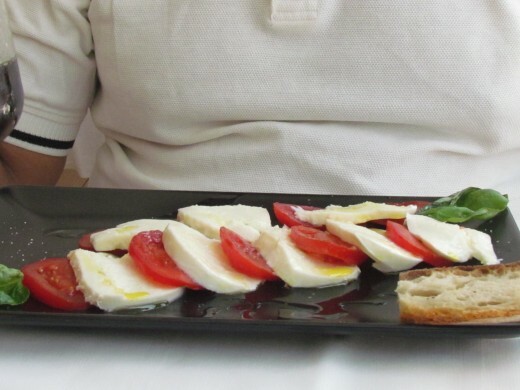 For lunch Walker had a delicious mozzarella and tomato platter. I had a mixed fried fish platter with squid and two different types of fish. It was delectable. The boardwalk that extended near beach area near the restaurant. 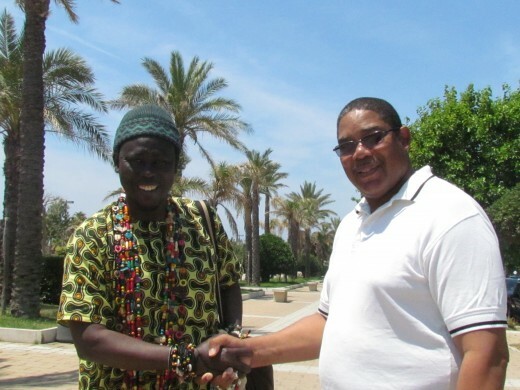 One of the vendors that was from Africa, sold jewelry near the boardwalk. 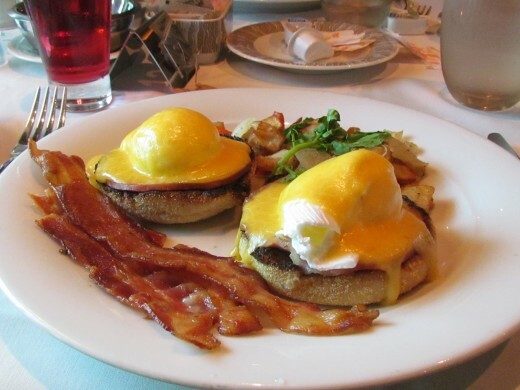 I enjoyed eggs benedict and bacon for breakfast before going to Civitavecchia. Omelets were freshly prepare at Taste Contemporary on deck 5. where we had breakfast before our getaway on the day of our anniversary. 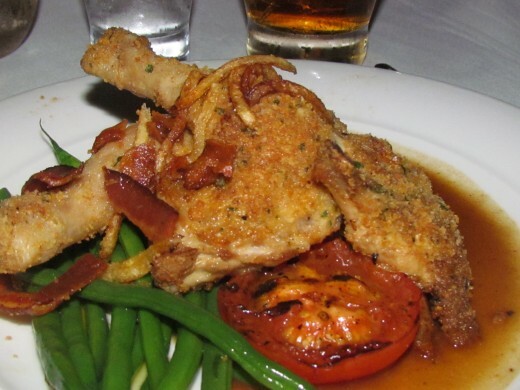 For dinner on our anniversary, we ate at the specialty restaurant Cagney's (A la carte). 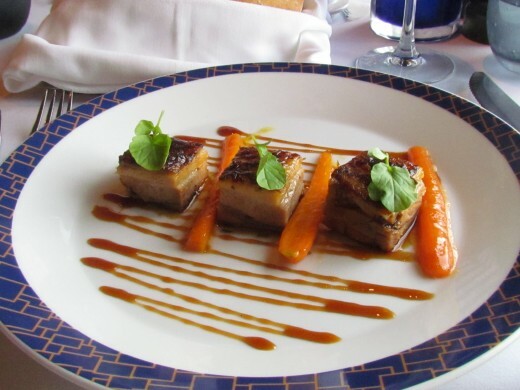 This was a delicious version of pork bellies which I had for an appetizer. 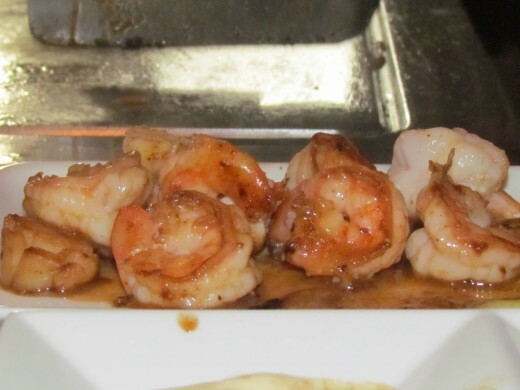 My husband had shrimp with cocktail sauce for an appetizer. I had a delicious soup as well before dinner. 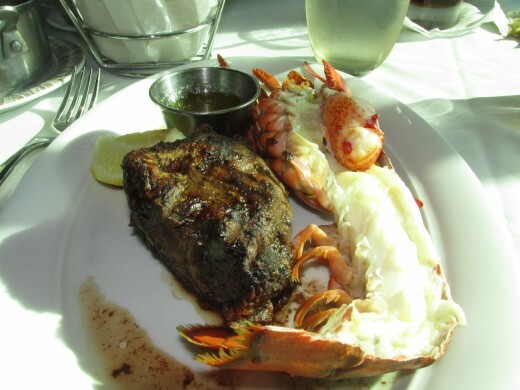 For dinner at Cagney's Steakhouse I had a surf and turf with steak and lobster. 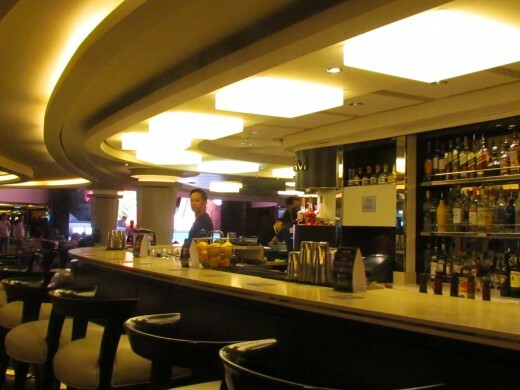 Included in our package was dinner at any specialty restaurants with alcoholic beverages at no charge. Walker chose prime rib with, onion rings, potatoes and vegetables. 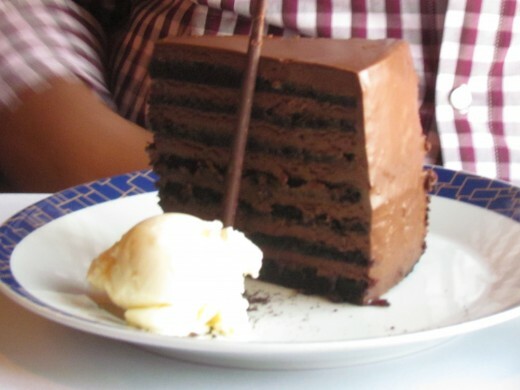 For dessert, Walker had chocolate cake with vanilla ice cream on the side. 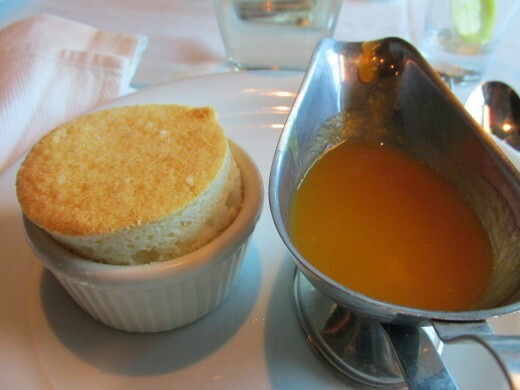 I had the crem-brulee for dessert which was amazing. 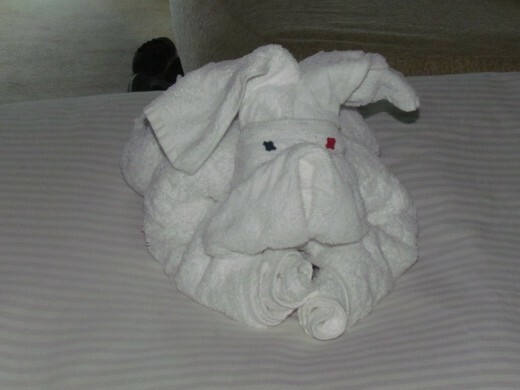 Upon our return to our stateroom, this new towel display awaited us. 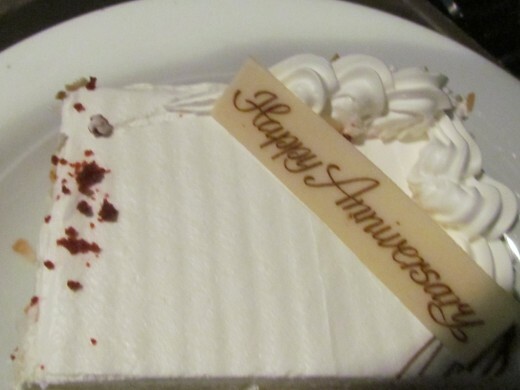 An anniversary cake was delivered to our room from Cagney's Steakhouse later that evening. 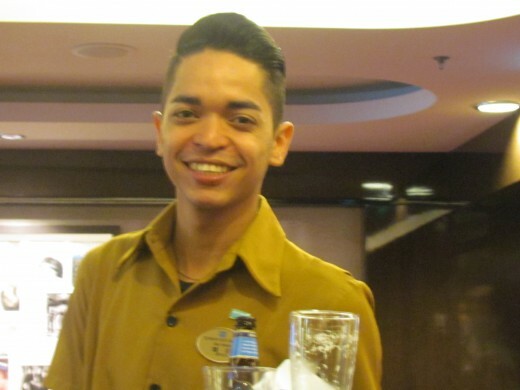 One of the extremely considerate and professional waiters that served us at our favorite lounge on Deck 7 near the elevators. A map of the area when we arrived in Civitavecchia (Rome), Italy. 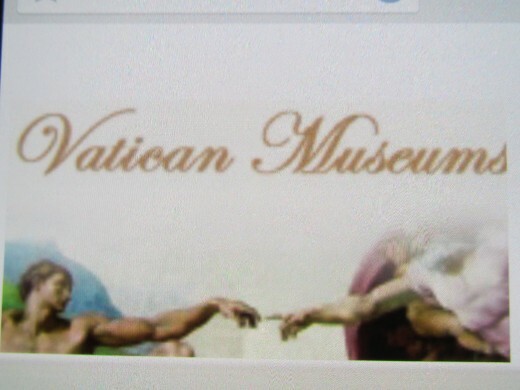 A photo from the Civitavecchia website of the Vatican Museums & Sistine Chapel. Photo from the Civitavecchia website of The Great Basilicas of Rome. 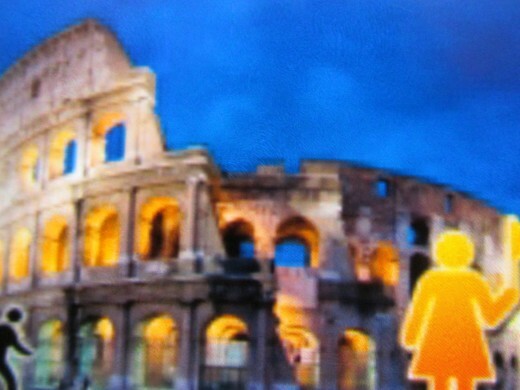 A nighttime shot of the Colosseum and Rome tour that you can book up to 24 hours prior to desired date. 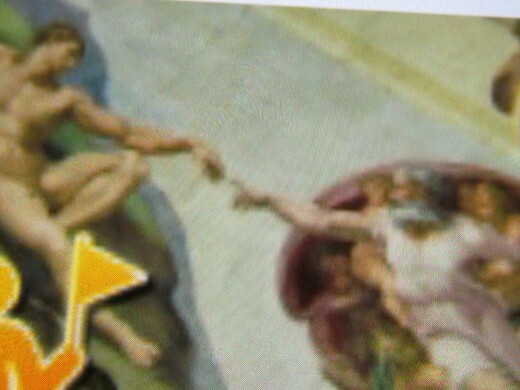 Another photo of the Sistine Chapel from Civitavecchia website. 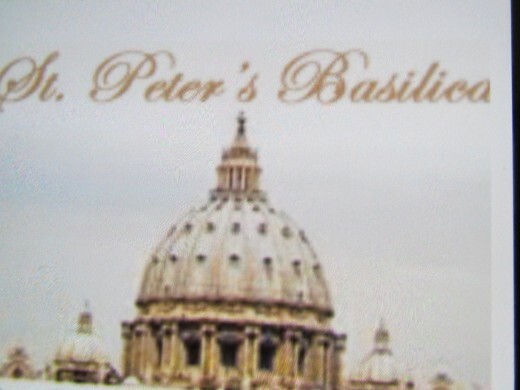 A photo from the website of St. Peter's Basilica & Papal Tombs. 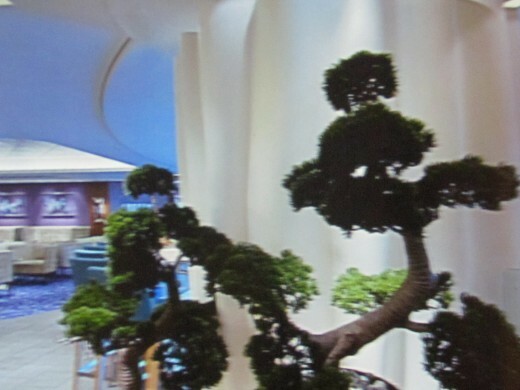 A display of a plant within the interior of the Epic. One of the lounges on the ship. 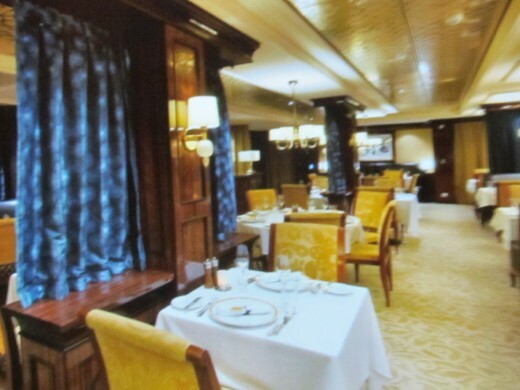 A dinning area near the windows of the ship. 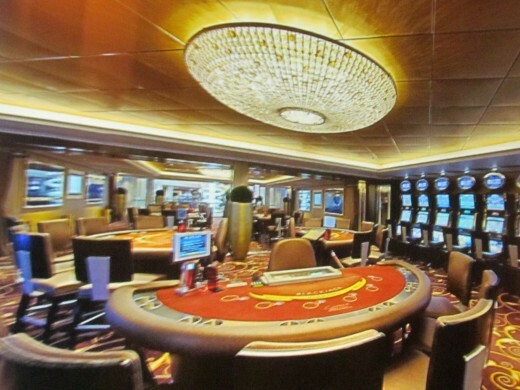 A photo of the casino on the Epic. A luxurious photo of the Mandara Spa where I received a back cleansing and foot massage. 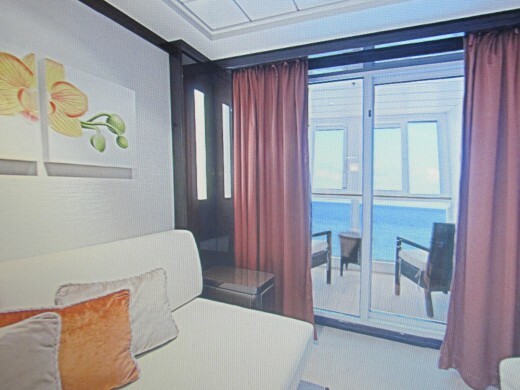 A photo from the website of one of the staterooms with a balcony on the Epic Norwegian. 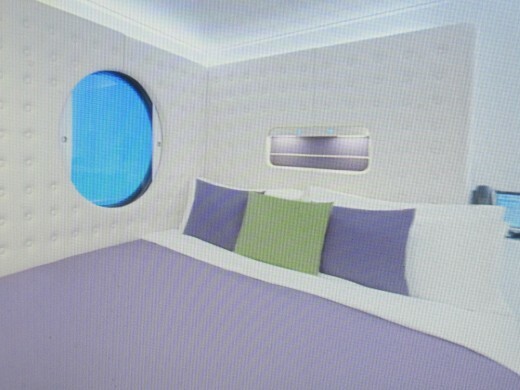 A photo of an inside cabin on the ship. 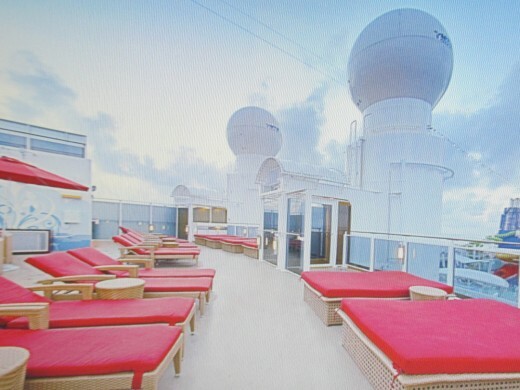 A photo of the upper deck for the purpose of relaxing after a swim. Wikipedia beautifully describes "Civitavecchia, Italy is a town and commune of the province of Rome in the central Italian region of Lazio. 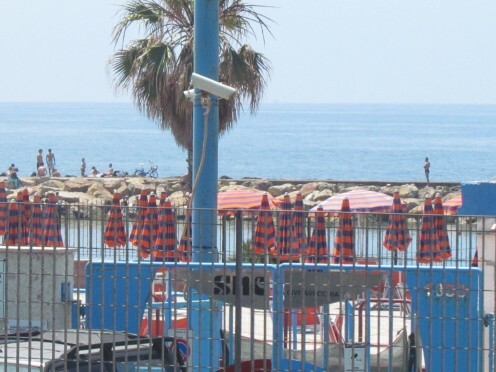 A seaport on the Tyrrhenian Sea, it is located 80 kilometers west-north-west of Rome, across the Mignone river. The harbor formed by two piers and a breakwater, on which is a lighthouse. 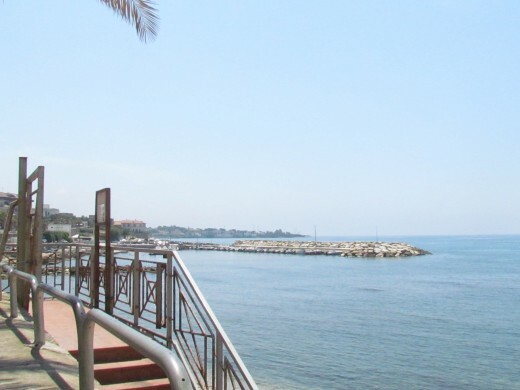 The name Civitavecchia means 'ancient town.'" 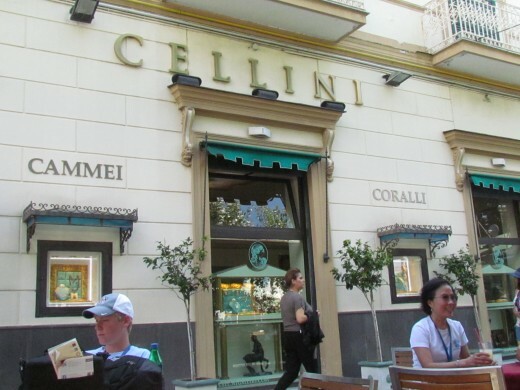 Major cruise lines stop and start at this port for shore excursions to see "Rome and Vatican sights, which are ninety minutes away." 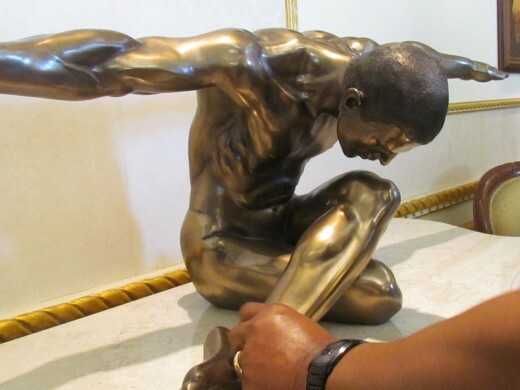 Tours organized for trips to the Vatican Museums, Sistine Chapel, and Raphael's Rooms. We could have also visited St. Peter's Basilica & Papal Tombs tours were also available. You can obtain these type of visits before you arrive for your cruise through Shore Excursions Group, LLC out of Weston, Florida. 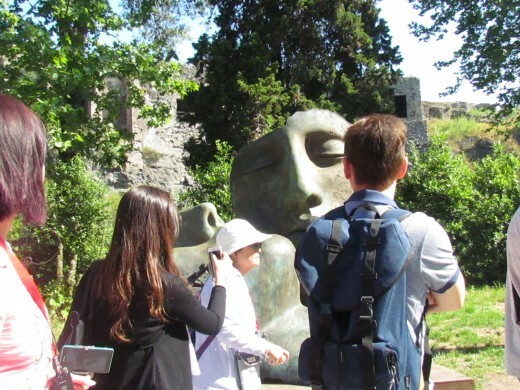 The cost of these excursions can range from about $50 per person for a few locations or up to more than $150 per person for a full package tour of Rome. Due to traffic and long lines, these type of tours not recommended since our cruise line departed from the port around 7:00 pm. For those reasons, we decided to keep our trip of the areas closer to the port. There are solutions to this dilemma whereas some cruise participants caught the ship in Rome on Wednesday, after spending a few days there. 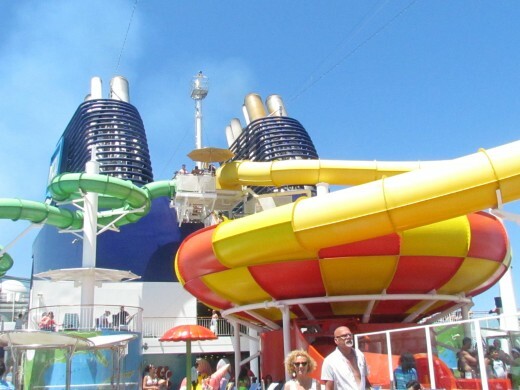 The variety of choices for the different ports of call can decrease the cost of your cruise as well. 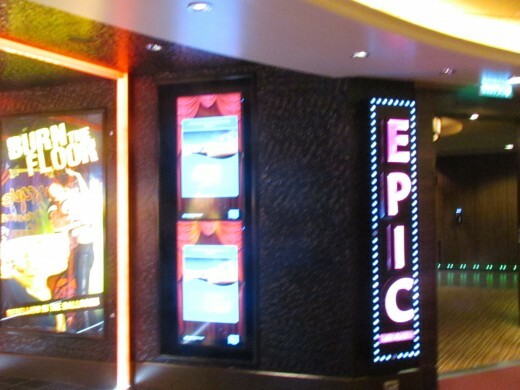 These choices can lower the cost to less than $800 per person on the Epic. 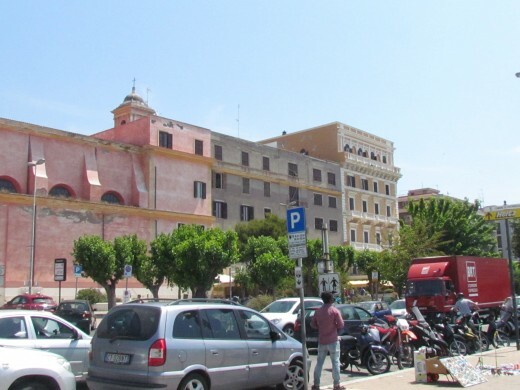 For our #Civitavecchia, Italy tour we decided to walk downtown. It was interesting to arrive on a major street and see two armed militia men near one of the stores. Unfortunately, the mistake made when someone attempted to photograph them. Without hesitation, they approached the individual and said, "No photos." One of the armed men seems as if he wanted to confiscate the camera from the tourist. 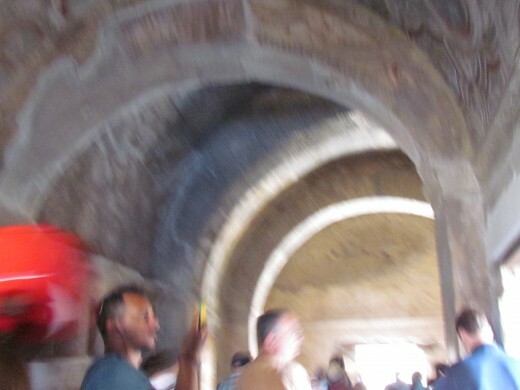 We continued past the vendors down to the coastal area where families enjoyed the rocky beaches under the ornate and unique historical archways. Restaurants lined the beachfront boardwalk. 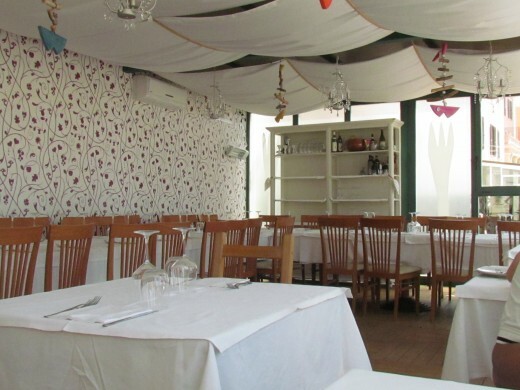 We decided to eat lunch at the quaint little Italian Caprasecca Al Mare Ristorante. They had just gotten fresh lobsters, crabs, mussels, clams, and fish delivered. We ordered the new fish dish which included fried squid. The mozzarella and sweet tomato dish were also delicious. Afterward, we did a little shopping and strolled back to catch the shuttle to the cruise line. Later that evening after a nap we had dinner at the incredible Cagney's Steakhouse on Deck 7. 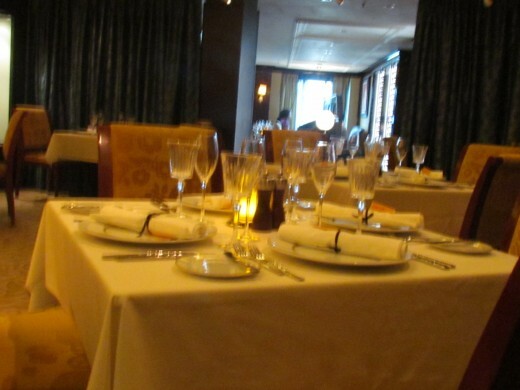 We had made reservations which suggested all the specialty restaurants to sit by the windows. 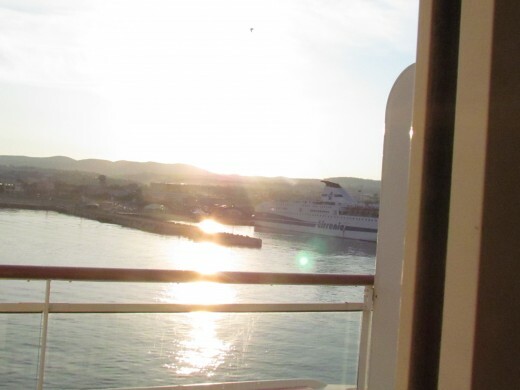 We watched the sun cascade beautifully across the sea as we left the port of Civitavecchia. 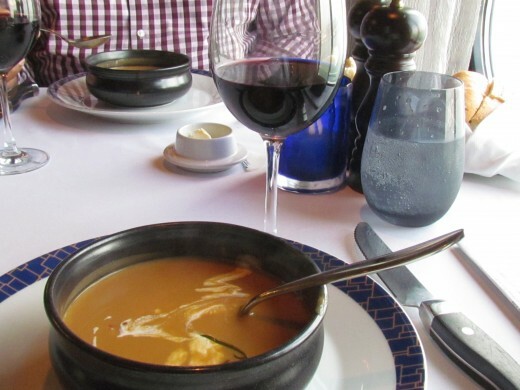 This signature restaurant offers a variety of selections. We started with their baked potato soup and pork bellies. These dishes are an absolute must-have. We followed our appetizers with their delicious prime rib and surf and turf platter. We had cognac for drinks after dinner. 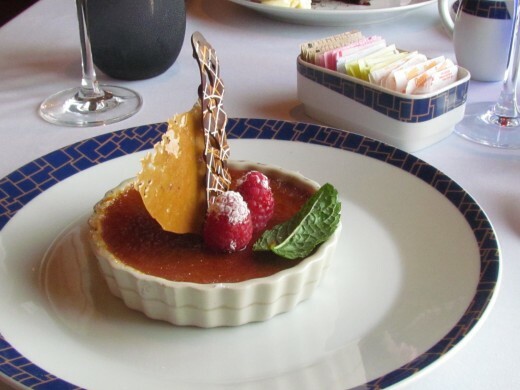 For dessert, we had crème Brulee and a beautiful mixture of fruit with a cream topping. 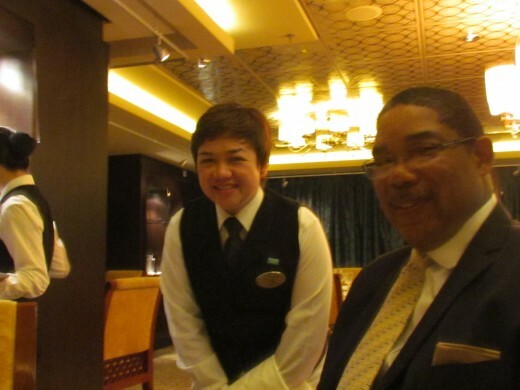 One of our best meals on the ship. 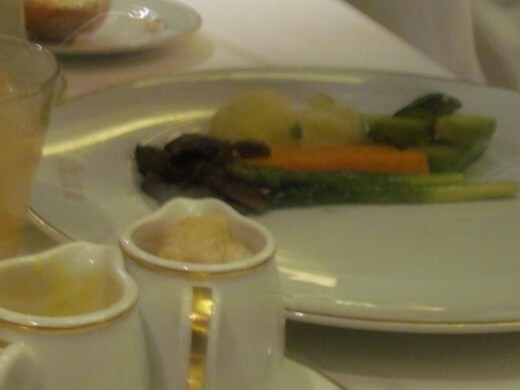 There was no charge for these meals or drinks with the specialty dining package. They asked if we were celebrating anything special. The waitress suggested that she would sing happy anniversary to us. We declined as she then suggested a free cake sent to our cabin as a part of our anniversary celebration. Our day in this Civitavecchia had been very relaxing and inspirational. The cost of a 7 Night Mediterranean Cruise with Freestyle dining and beverage package and nonstop round trip airfare directly to the port where ship departs. What do you think a 7 Night Mediterranean Cruise with freestye dining and beverage package and nonstop round trip airfare should cost? 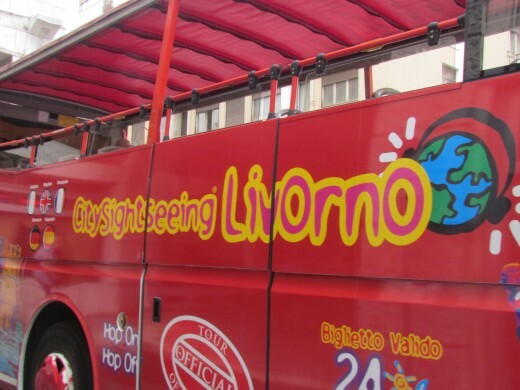 After taking a shuttle to center city Livorno, Italy we took a colorful open top bus to a sky car that took us in the mountains for spectacular views. 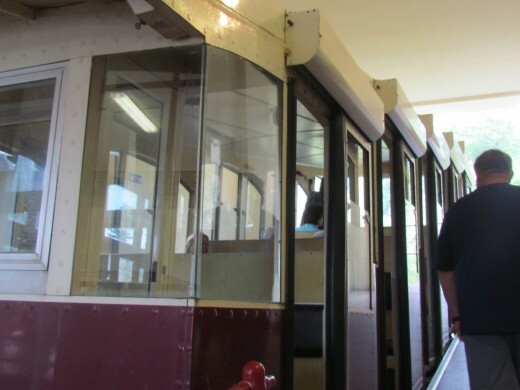 The trolley ride in Livorno up to the mountain top gave us a view of the leaning Tower of Pisa. One of the beautiful structures in the downtown area. 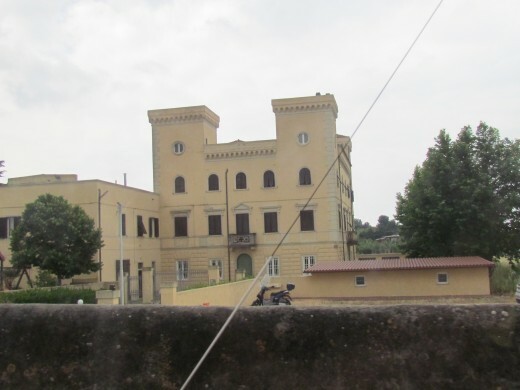 A home that we pass while on the trolley up to the top of the mountain in Livorno, Italy. A tower we passed during our tour in Livorno. 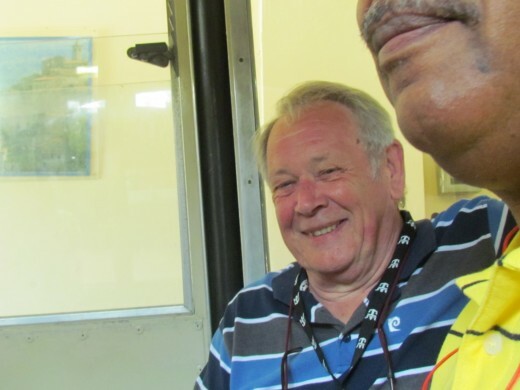 Robin Graham, from the UK shared the sky car ride with us. 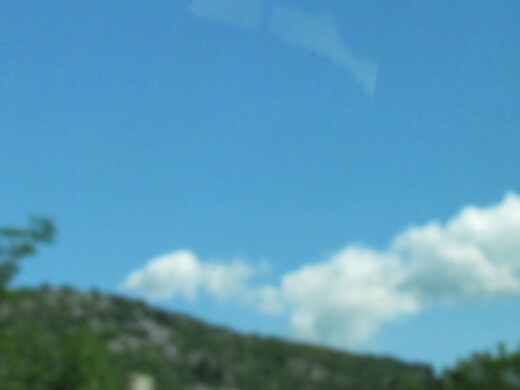 A photo of the t sky car that we took to the mountains. One of the beautiful structures we passed during our tour. 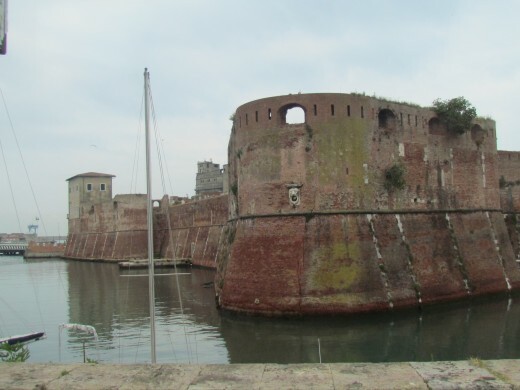 The ruins of a castle in the port of Livorno, Italy. 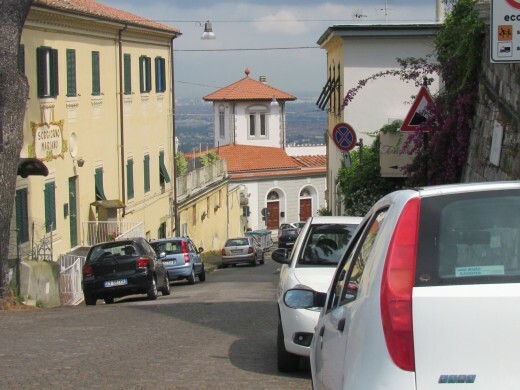 A quaint little town at the top of the mountain in Livorno where we grabbed a quick sandwich. Motorcycles, are some of the main vehicles used in Livorno. Italy. 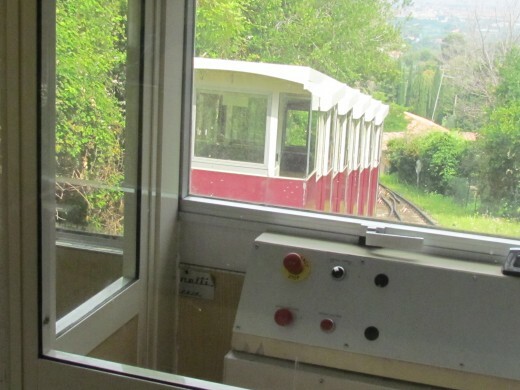 Jim, also share the sky car with us in Livorno. He had a unique opinion about Donald Trump running for President. Other sky cars passed as we were on our way up the mountain. From the mountain top, you could see the rooftops and other amazing sites. 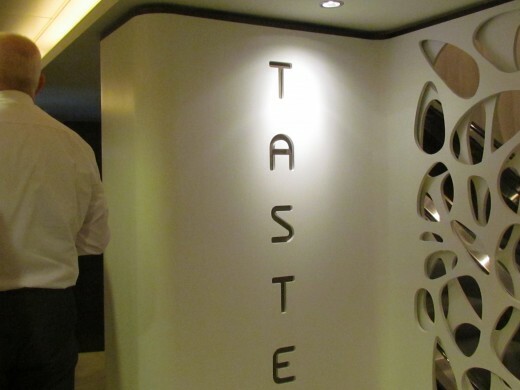 Taste Contemporary Restaurant is on deck 5. It is one of the two dining rooms. 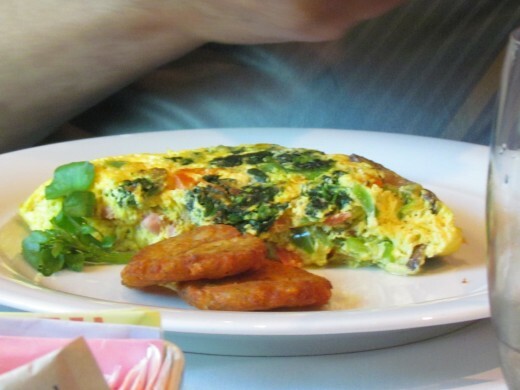 Specialty dishes can ordered such as omelets, eggs benedict, waffles and pancakes. 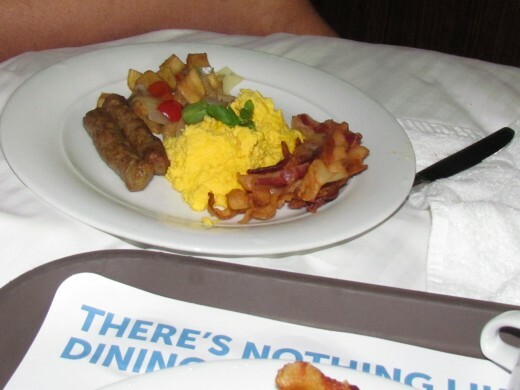 We ordered room service for breakfast one morning which is also part of the specialty dining package. 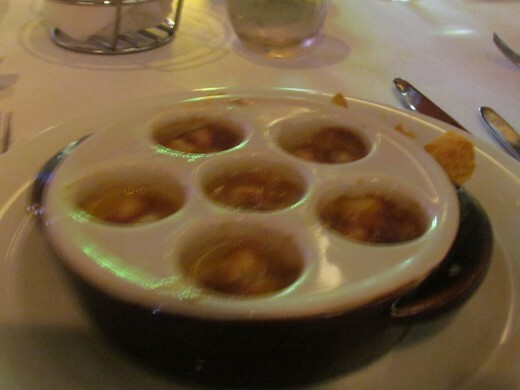 Scallops were served as an appetizer before the main course. We shared the table of five with a mother from California. Her daughter joined us at the table both were from California. 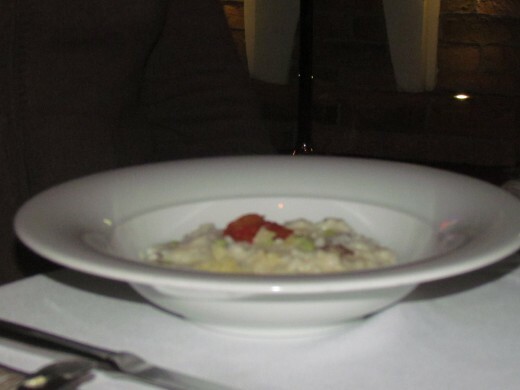 One of the guests at our table were served rice pudding as a dessert. This couple was from Scotland. They advised us that Donald Trump has Scottish heritage through a grandmother that resided in the area. His wife was very pleasant as they joked about Donald Trump visiting their area. 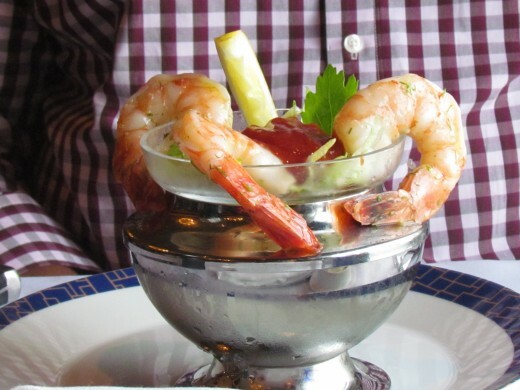 One of the delicious shrimp dishes we were served. Cornish hen was served for dinner. Another one of the desserts that were served. 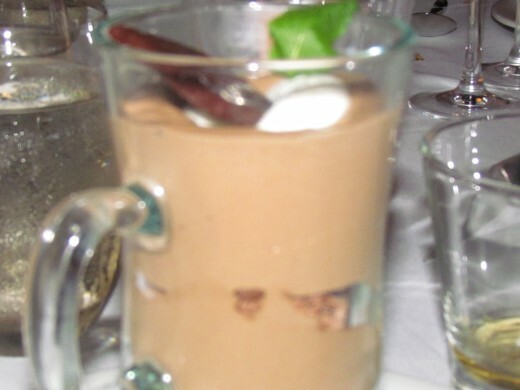 Chocolate pudding, was served as one of our desserts. 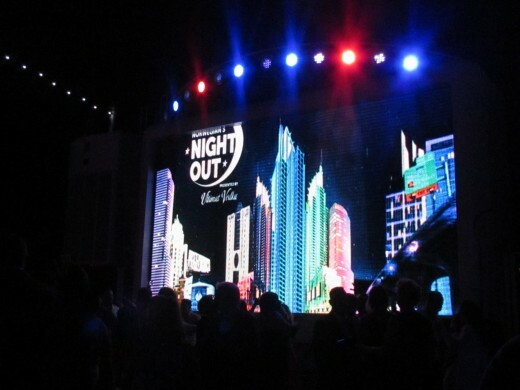 We enjoyed a night out on the 15th deck where a theme party and dance contest was featured under the stars. 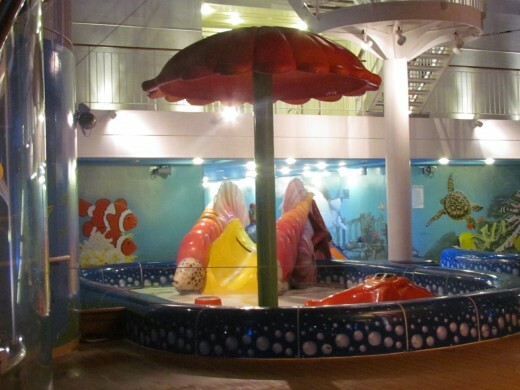 This is a photo which is part of the play area on deck 15 for the children on the Epic. 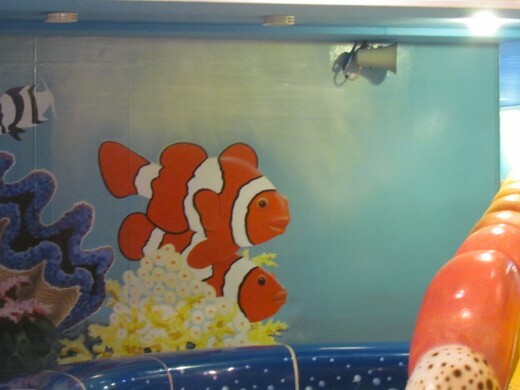 Drawings of Nemo, were featured around the play area. 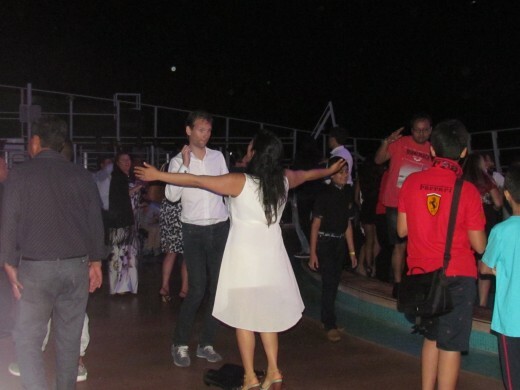 Young and old danced the night away on deck 15. 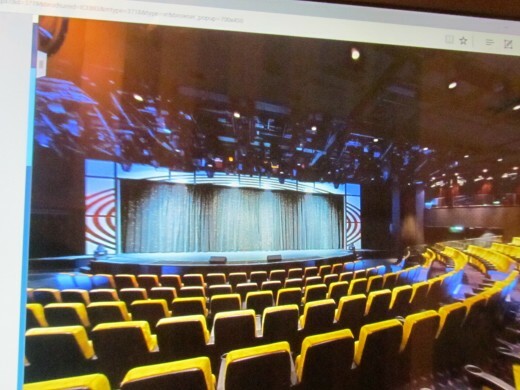 A large screen is featured on deck 15 where movies and other photos are presented. 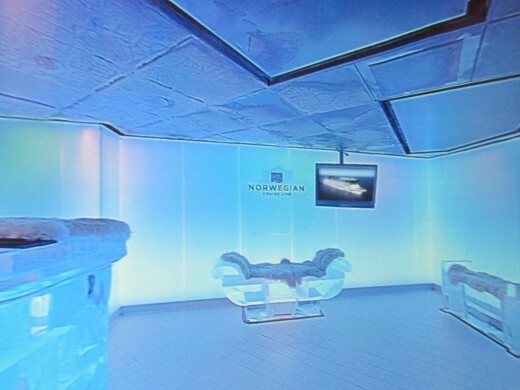 The Ice Lounge on Norwegian Epic. Some tourist visited this location where you had to wear special coats because of the temperature and two drinks were included. 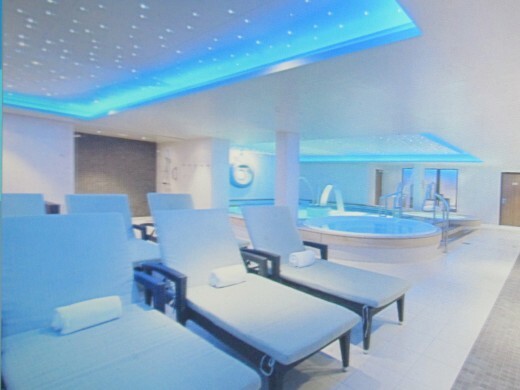 A safe haven for relaxation on the ship. 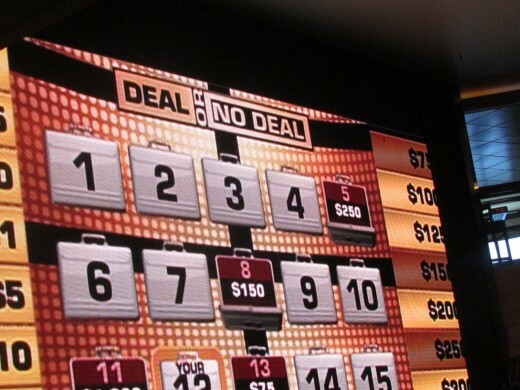 The game "Deal or No Deal" was played by some during the cruise. A magnificent appearance of the sun across the water in Livorno. 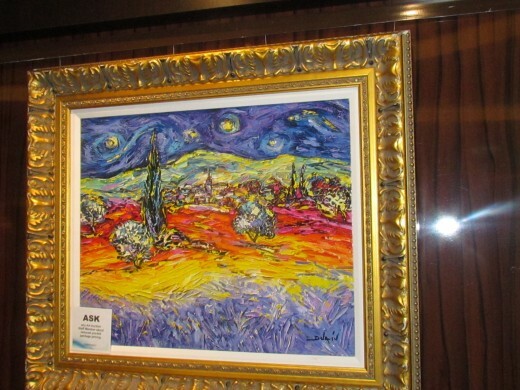 Items displayed at the Art Expo that was presented on the ship. 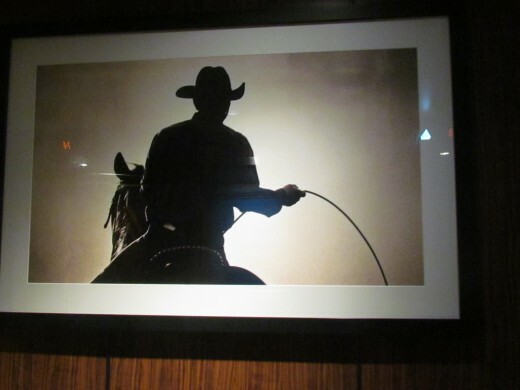 A photo of a cowboy in darkness that we used in order to know exactly where we were on the ship. 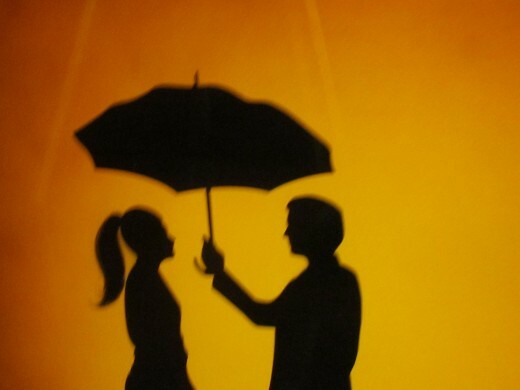 An adorable photo that was also displayed during the art show. Sounds of Italian music played in our ears as we passed through the beautiful city of Livorno, Italy. Neatly dressed women and handsomely dressed men stood near their businesses as we passed them in our red bus with an open top. 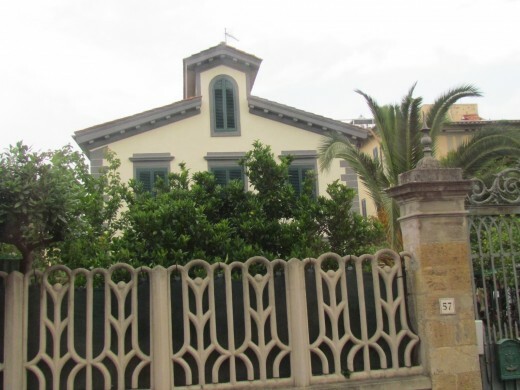 "Between 1590 and 1603, the city of Livorno was established with laws that were directed to Jews that lived freely up to a period of unity of Italy," stated the recording on the tour bus. 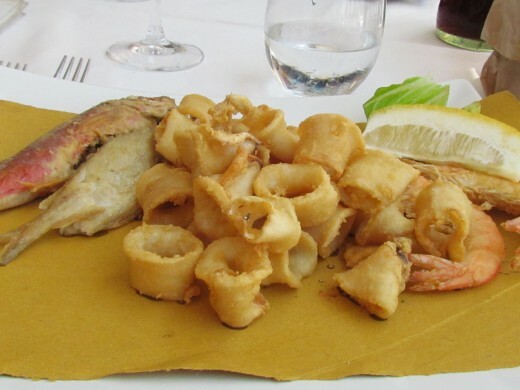 The recording also mentioned, "a sort of fish soup is the symbol of Livorno. 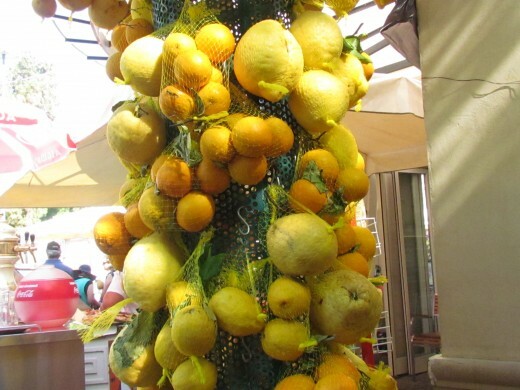 Pachuco is a fish and then a strong coffee with lemon zest," was also famous with a lot of the residents in Livorno. There was also a discussion about the popularity of the expressionist movement which influenced their artwork in area museums. 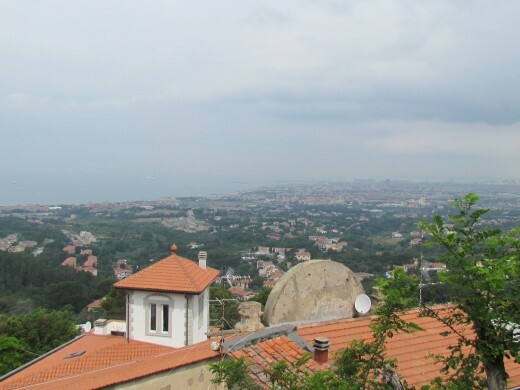 The very best part of our visit was our ride on a sky car up to the mountains which overlooked the delightful area of Livorno. 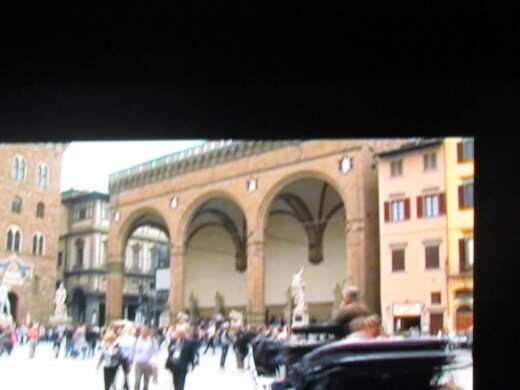 Florence, Italy is about a two-hour drive from Livorno. How sad to hear through news stories recently that such beautiful towns as Livorno, that exist in mountainous regions of Italy were devastated by an earthquake. More than 250 were killed and numerous historical sites were destroyed in the towns of #Amatrice and #Pescara Del Tronto, Italy. We send our love and prayers out to the residents of these once beautiful, historical regions. 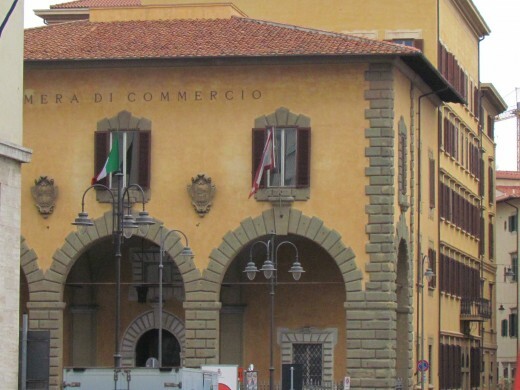 The Livorno, Italy tour was about $150 which we purchased before our trip from the excursion website that is not directly connected with the Norwegian Cruise Line. 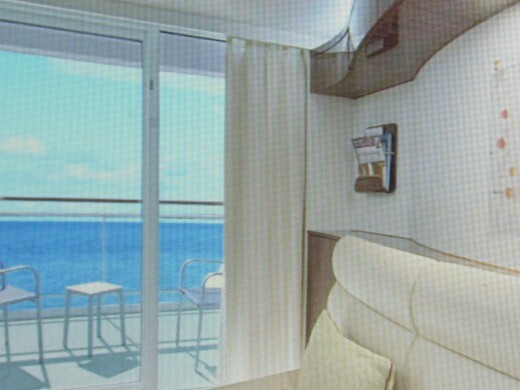 You can also wait until you are on the ship to order your excursions as well. The prices are pretty much the same. 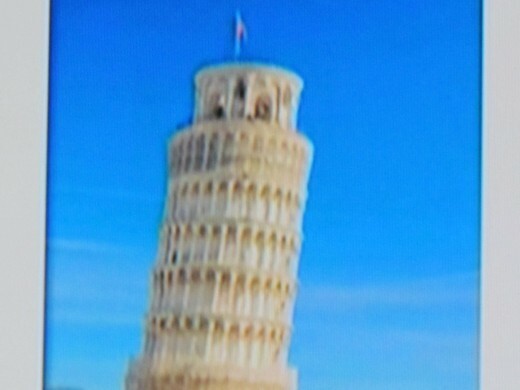 Other excursions such as the Ultimate Florence & Pisa-David & Tower Climb, is about 326 Euros, Florence & Wine Tasting at a Tuscan Castle, is 155 Euros, Pisa & A Taste of Tuscany, is 167 Euros and a Pisa Trolley Ride is 96 Euros. All of these tours and how many hours they are as well as cost, can be obtained on a brochure from Guest Services and Shore Excursion desk of the ship. 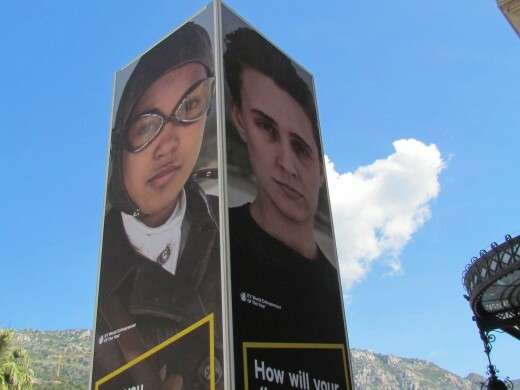 A photo in Monte Carlo, Monaco near the Casino and Hotel Paris. Hotel Paris, with its glorious fountain near it. 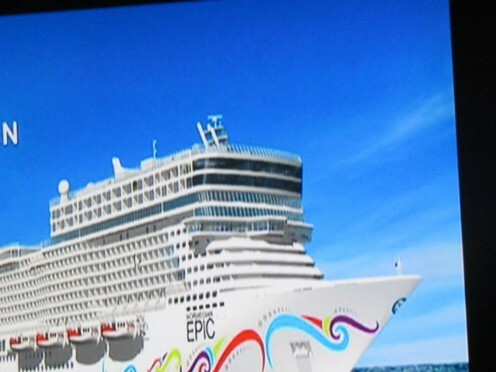 A photo of the Epic Norwegian Cruise Line we sailed on. 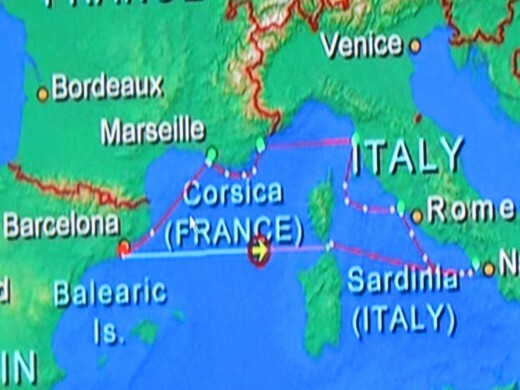 A photo of the map from Barcelona and areas where the Cruise Line will travel. 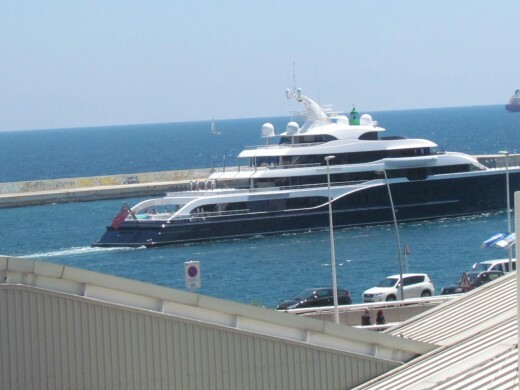 A ship that was docked in Monte Carlo, Monaco. 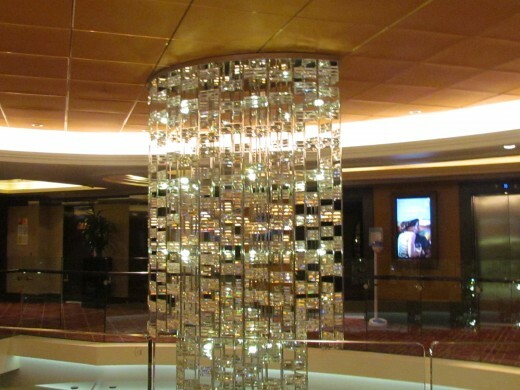 A beautiful chandelier that is in the center of the Epic Cruise Line. 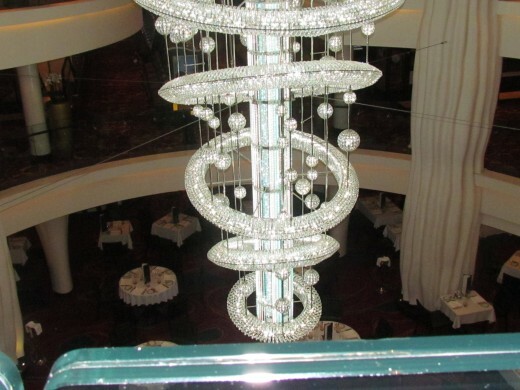 Another magnificent chandelier on the ship. 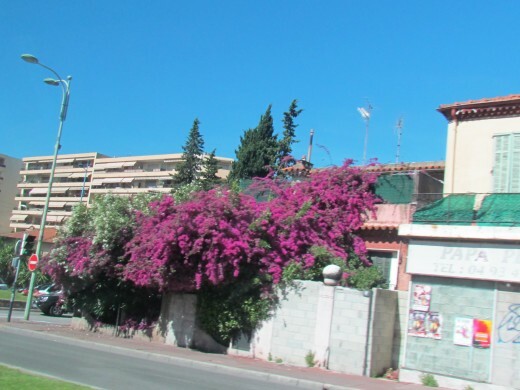 A photo of downtown area of Monte Carlo. 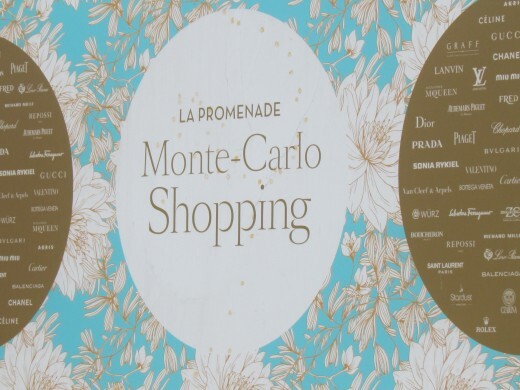 Shops near the Hotel Paris and Casino Monte-Carlo. 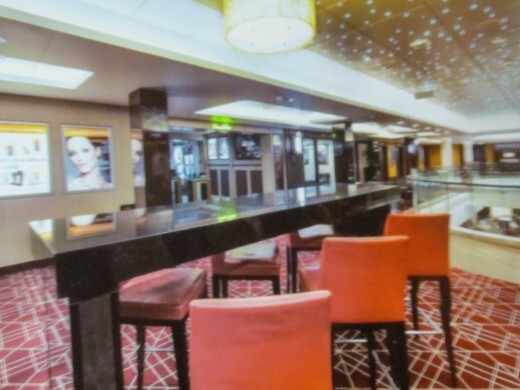 One of the bar and lounges on the ship. 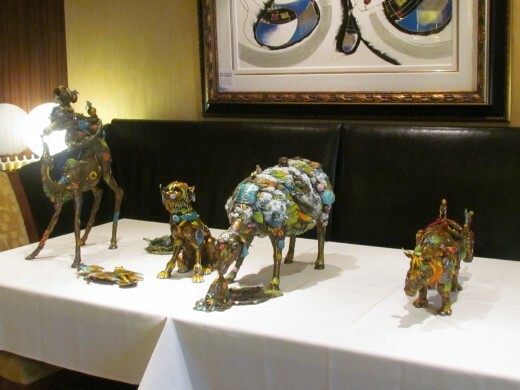 We attended an art auction held at Le Bistro Restaurant. The artwork was absolutely beautiful. This interesting piece that was among the art show at Le Bistro. The Epic Theater where nightly performance were held. 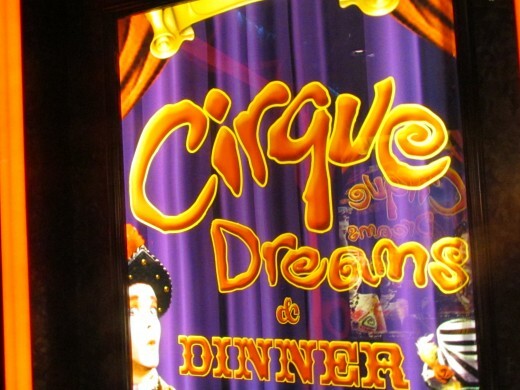 Cirque Dreams, was another major performance that we enjoyed. Dinner was also served with this performance. 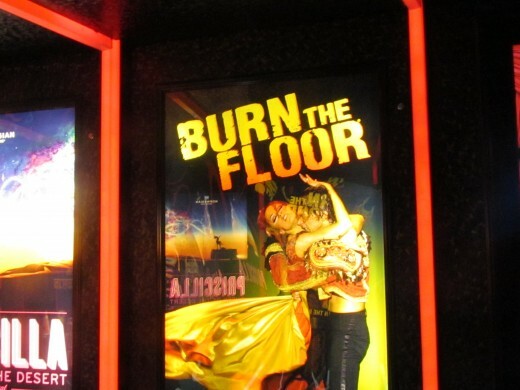 Burn the Floor, was an amazing performance we saw in the Epic Theater. This show originated from Broadway with dancers from "Dancing With the Stars." This is a must see. 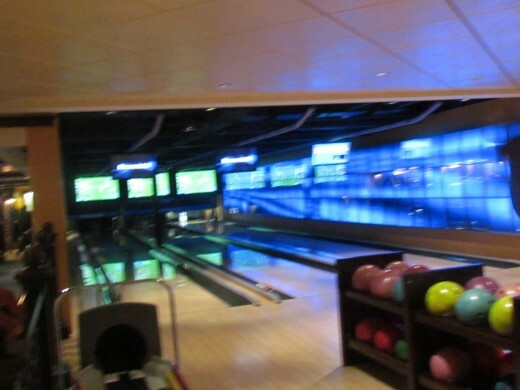 The bowling alley on Epic where we played a game. Another piece that I appreciated on the ship. 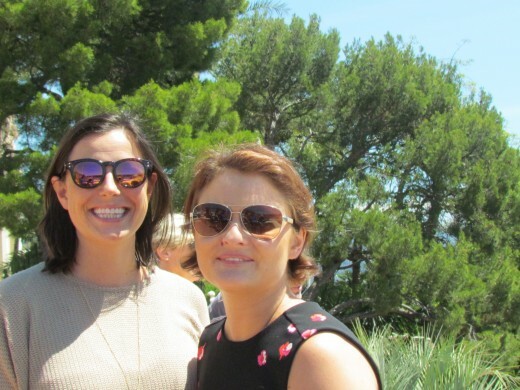 We take a moment for a quick photo while in Monte Carlo. 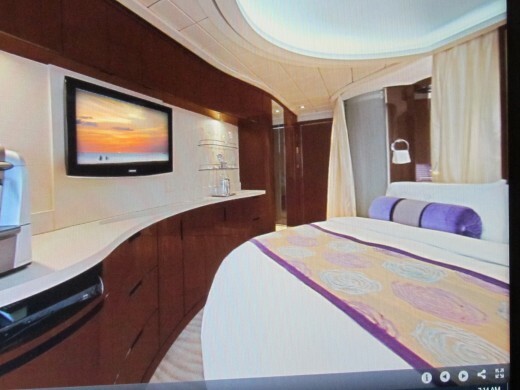 The ocean view cabin on the Epic Norwegian. The waterslide many of the children enjoyed during the day on the ship. 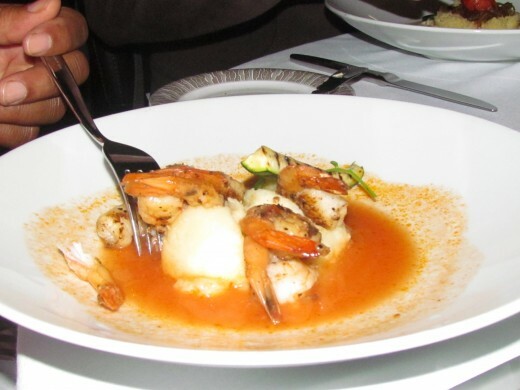 Le Bistro Restaurant's food is outstanding It is the one offered in packages for Honeymoons, Anniversaries and special days for couples. Le Bistro's, beautiful table setting. 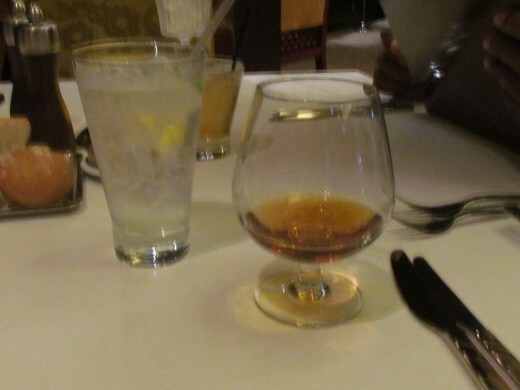 Remy Martin Cognac and club soda was served with dinner. An appetizer of Lump Crab Cake with horseradish, mango and orange sauce with citrus. 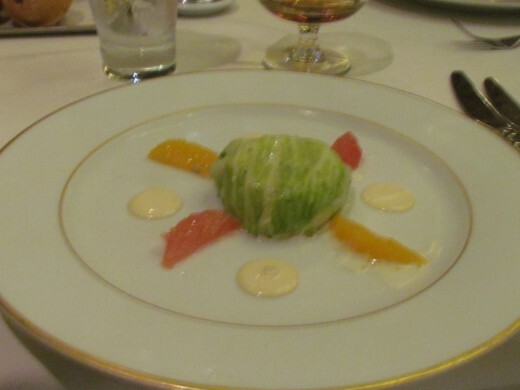 It was wrapped in lettuce we enjoyed before dinner at the Le Bistro. 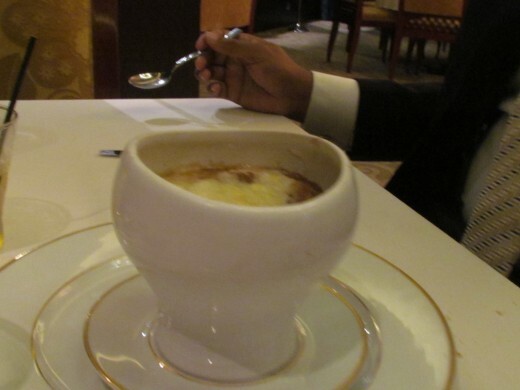 A delectable French Onion Soup that we had at Le Bistro Restaurant. It was covered with a Gruyere Cheese Crust. Our server for the evening was the very attentive Shella. The Manager, was amazing as well. He made sure we were happy with our food and the service. Good job staff of Le Bistro. 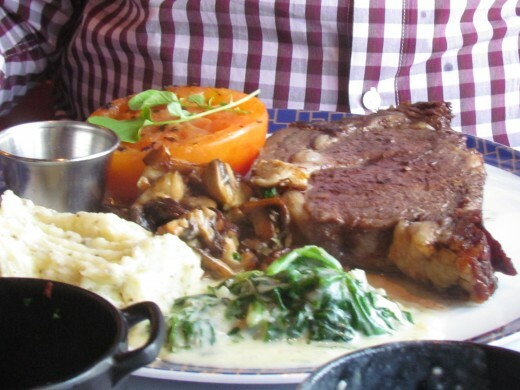 At Le Bistros my husband had the 32oz Certified Angus Beef Ribeye Steak for Two. He said it was the best steak he has even had. 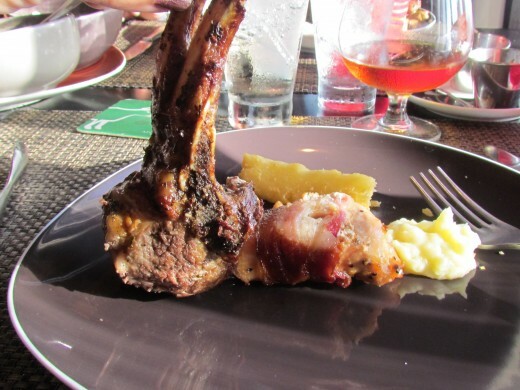 I thoroughly enjoyed the bone with portions of meat still attached. It was absolutely delicious right done to the bone. 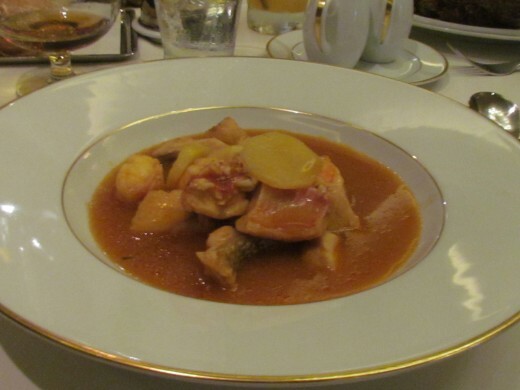 I had the Mediterranean Stew of Fish and Lobster in Saffron Broth. It was delectable as well. We wanted the best restaurant for our 30th wedding anniversary celebration. 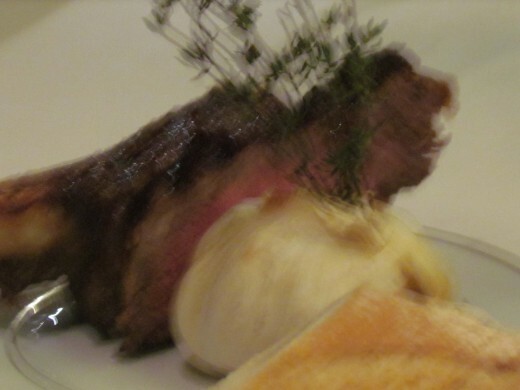 Potatoes were served with the delicious steak. Legumes de Saison which was like pastries covered with chocolate was served as our dessert. It was outstanding. This concluded our amazing meal at Le Bistro. A beautiful shot of Nice, Italy as we were on our way to Monte Carlo. An amazing sunset we took after returning to our stateroom. An area near Nice, Italy with its beautiful water setting. Mountainous are surrounded by white puffy clouds while we were in Nice, France. A museum in the rear of Casino de Monte-Carlo. 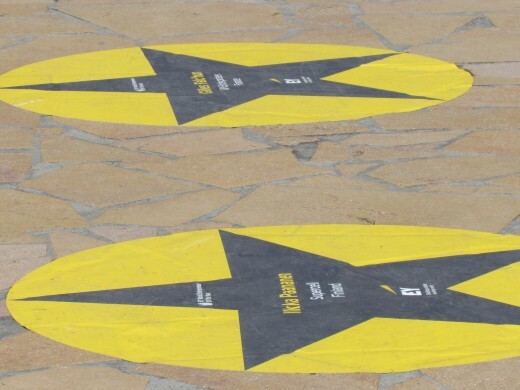 Stars that lined the sidewalk near Hotel Paris. Center of the square where Hotel Paris and the casino was located. 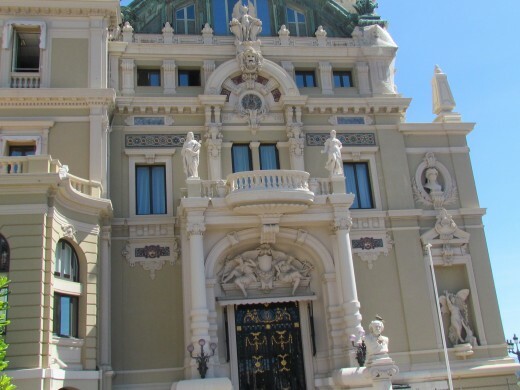 A magnificent structure in Monte Carlo. On our way from Cannes to Nice, France. Beautiful flowers in the city of Cannes, France. 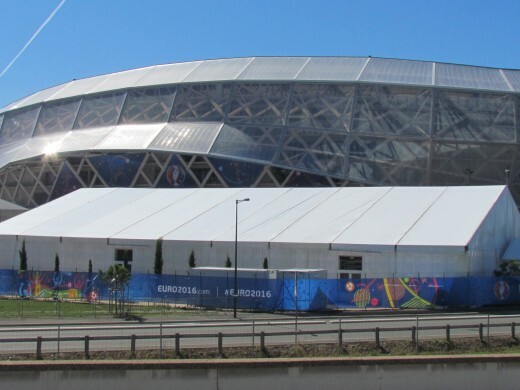 The soccer stadium near Cannes, France. 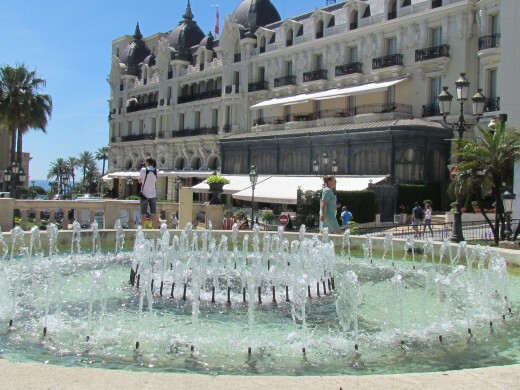 interesting photos surrounded the hotel and casino in Monte Carlo. A front shot of Hotel De Paris. 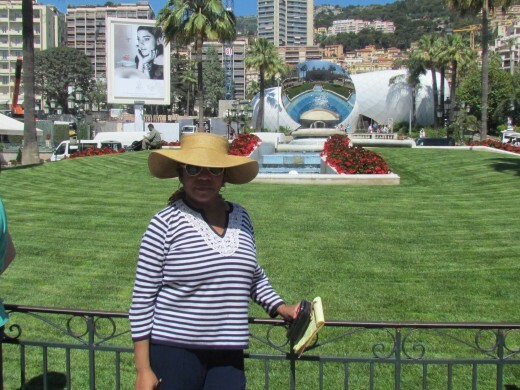 A photo where we were near the center square downtown Monte Carlo, Monaco. 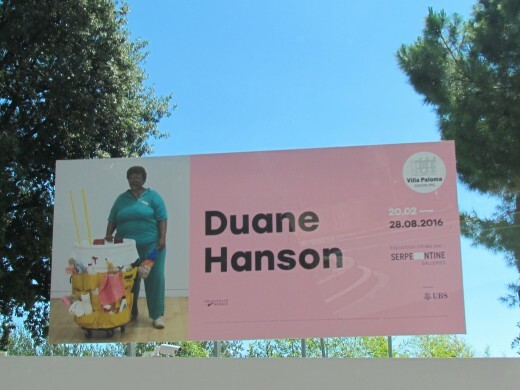 It was interesting to see a sign of dedicated hard workers that were acknowledged as you enter downtown Monte Carlo. One of the couples we rode with on the tender which we used as a shuttle to Cannes,France. We had this delicious sherbet on a cone. It was so good. 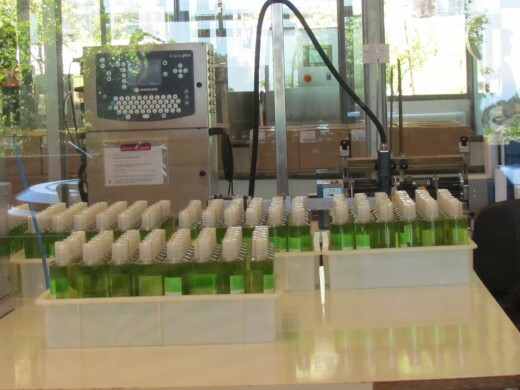 This is the perfume factory we visited in Nice, France . 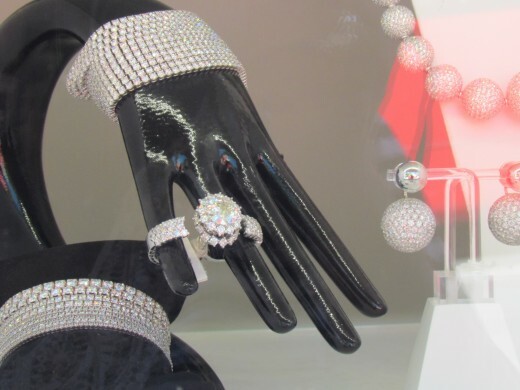 A beautiful ring in the store window of Prada downtown Monte Carlo. 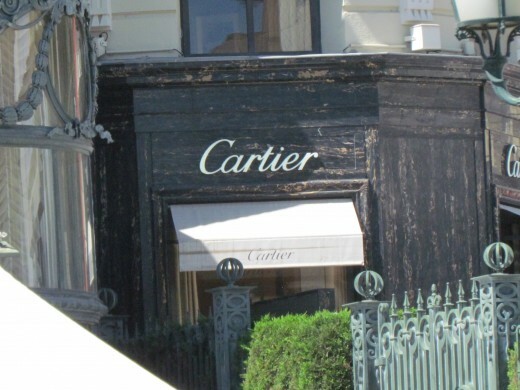 Cartier was one of the stores near Chanel, downtown Monte Carlo. High rises downtown Monte Carlo. 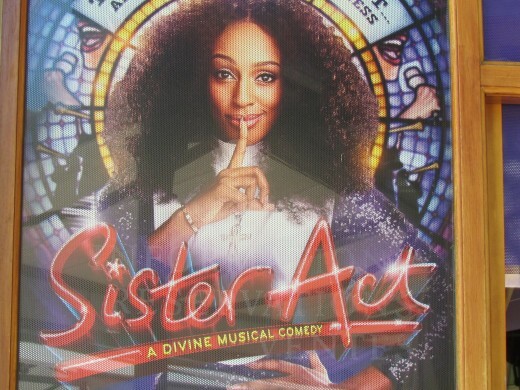 The play Sister Act was being shown downtown Monte Carlo. 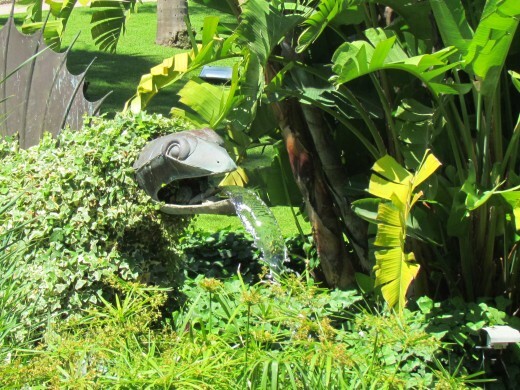 This is the beautiful garden that near Hotel De Paris. One of the restaurants we went in that is near Hotel De Paris and the casino. 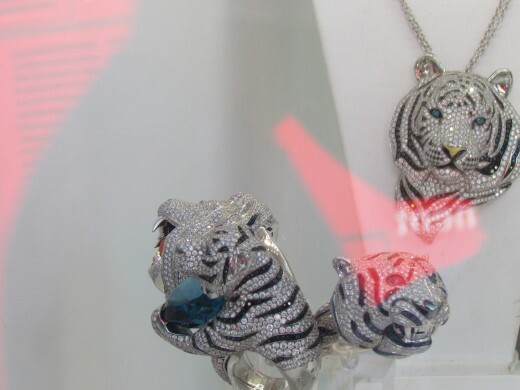 Some jewelry that was displayed in the window of Prada, downtown Monte Carlo. 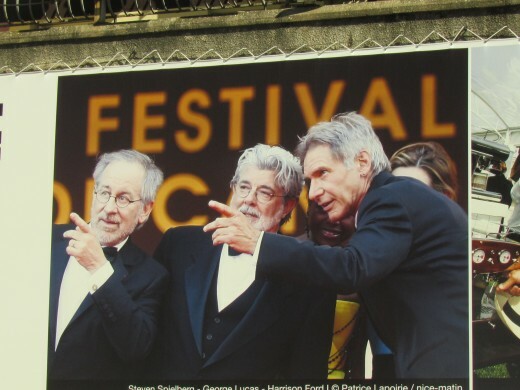 A photo of #Stephen Spielberg, George Lucas and Harrison Ford who attended #Cannes Film Festival previously. 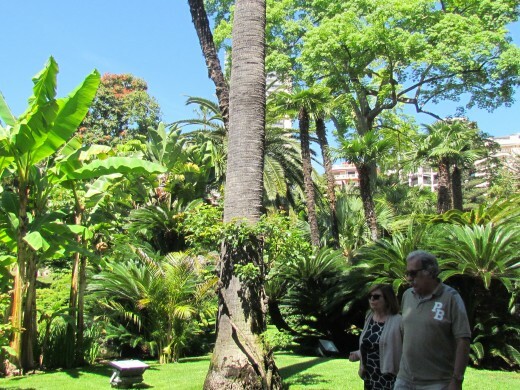 Another portion of the beautiful garden downtown Monte Carlo, Monaco. 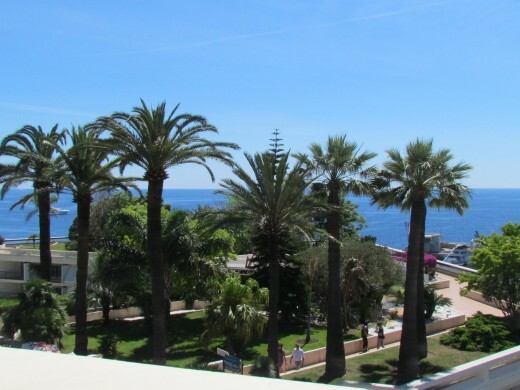 Beautiful trees surrounded the city of Monte Carlo. A photo from the pier in Monte Carlo. This black Bentley, was parked in front of the casino. 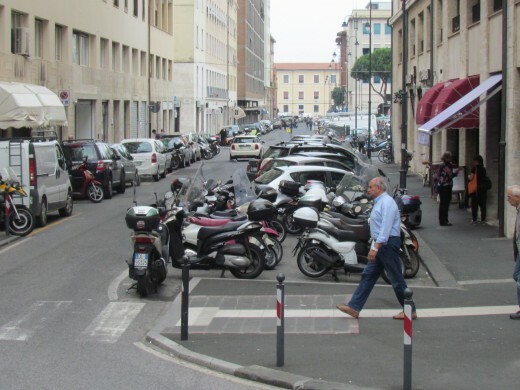 A street scene in Nice, Italy where traffic can be a little hectic. A Monte Carlo shopping sign downtown. 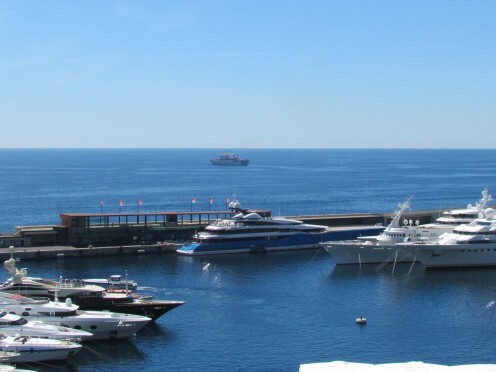 The port downtown Monte Carlo. An employer and her nanny Crista, were visiting Monte Carlo from Florida. 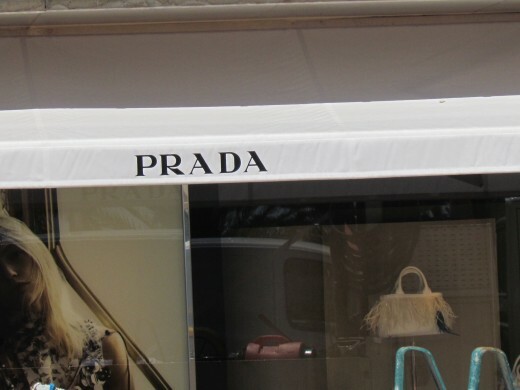 The front of the Prada store downtown Monte Carlo. A tour we took of the perfume factory in Nice, France. 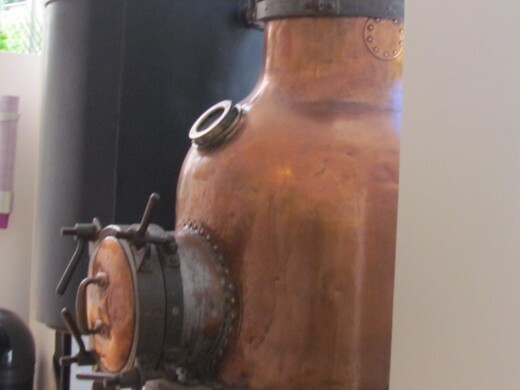 These distilleries were used to create the perfumes. 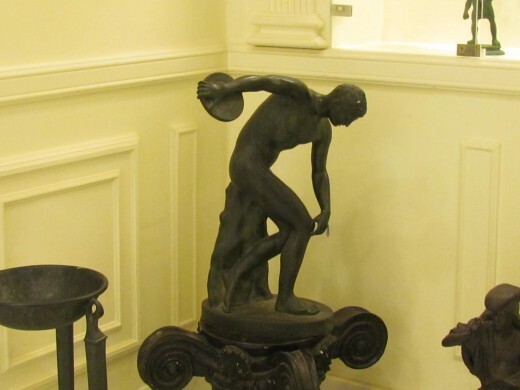 Statutes that were displayed inside of the perfume factory. 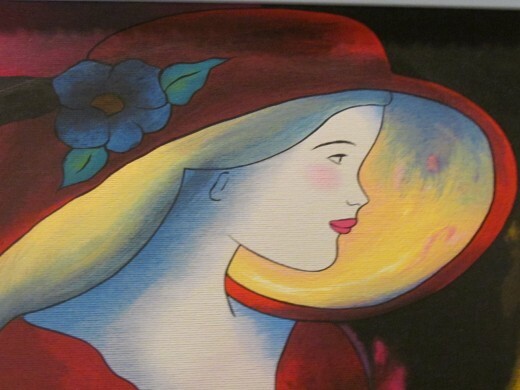 An adorable little photo that was also displayed within the perfume factory in Nice, France. 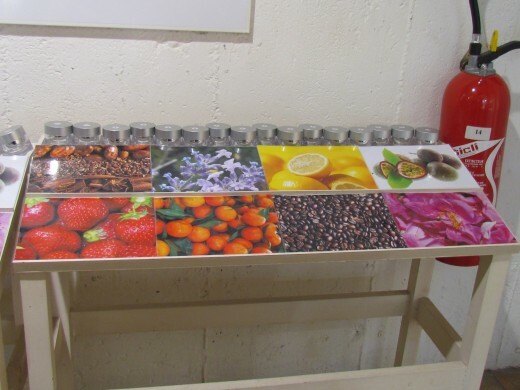 A photo section where you play a game selecting which flowers were used to create what perfume. Signs that showed us the way to the downtown area. 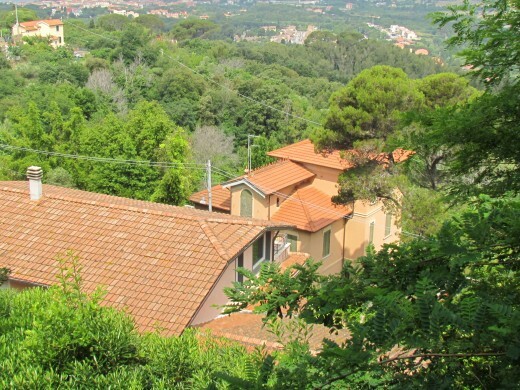 Homes on the mountain side near Nice, Italy. 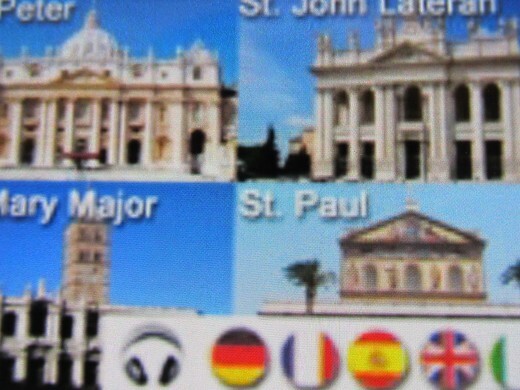 which is capital of the French Riviera. 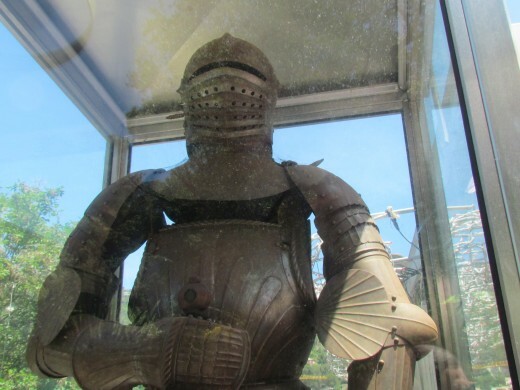 An armored guard was on display in Nice, France. Beautiful shoreline areas near Monte Carlo. 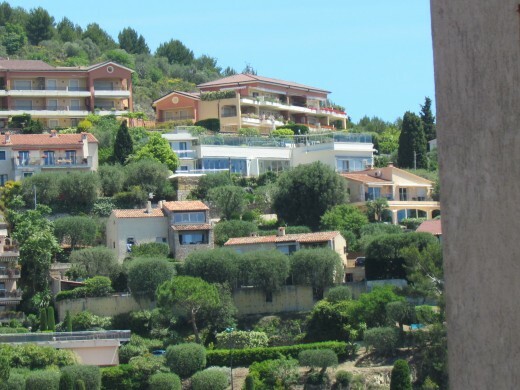 Homes in the area of Nice, France. Amazing white clouds hovered over the mountains near Nice, France. 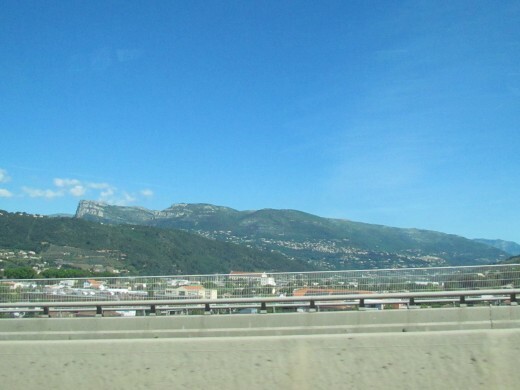 This photo was taken on our way to Nice, France coming from Monte Carlo. Homes in the downtown are of Eze, France. Another shot of this beautiful white cloud hovering over mountain in Nice, France. 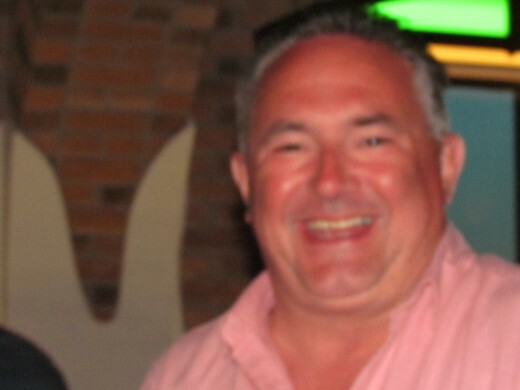 David, was our private driver for our tours in Cannes, Eze and Monte Carlo. We rented this van and had David as our driver. This allowed us to stop and take photos as well as grab something to eat. We enjoyed this nice clean vehicle and David was very patient and knew the best places to go for tourists. A mother who was from New Jersey. Her daughter had just won a top model contest. 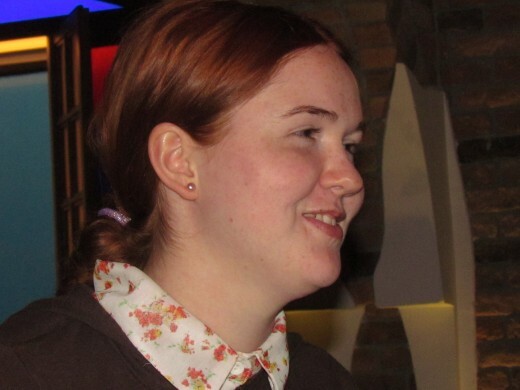 This young woman who had just won a top model contest. We rode back with her and her mom on the tender on our way back to the ship after our tours. 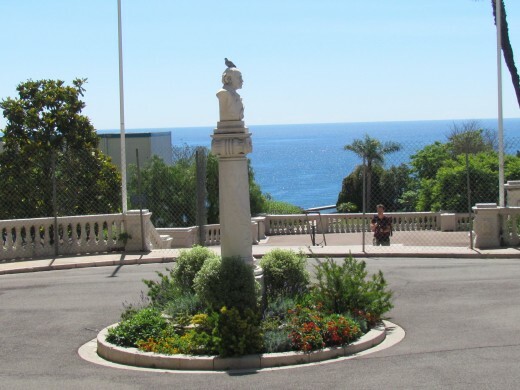 The Monte Carlo, Eze, and Nice, France was my favorite location to visit. 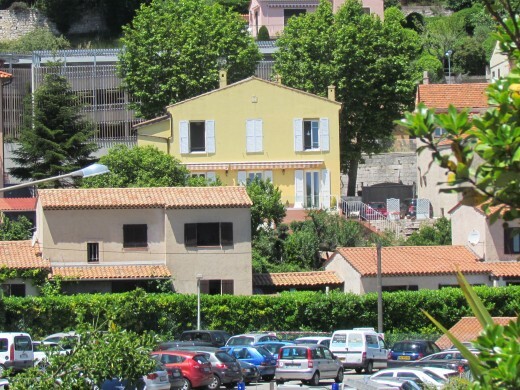 "Nice, capital of the #French Riviera, skirts the pebbly shores of the Bale des Anges. Founded by the Greeks and later a retreat for 19th-century #Europe's elite, the city today balances old-world decadence with modern urban energy," expressed Mobile-friendly. 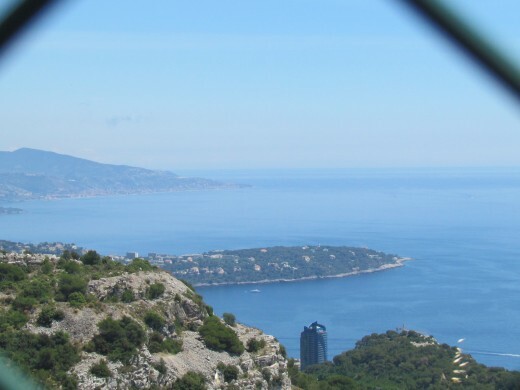 Eze is located in "southeastern France and is not far from the city of Nice. 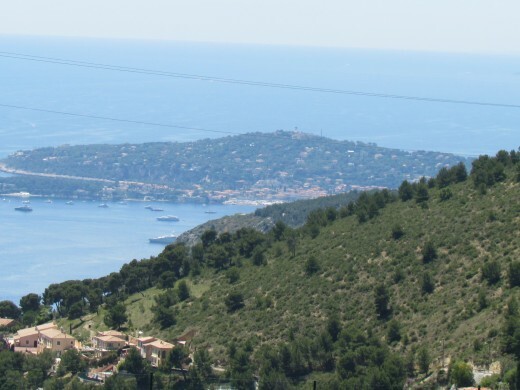 Your jaw will drop at the gorgeous view of the Mediterranean from Eze, a charming hilltop town on the Cote d' Azur. The tiny village of Eze is one of the jewels of the south of France which is probably why it is chosen as a holiday spot. . ." Tragically, in the news recently a total of eighty-four were killed and more than two hundred injured as a truck driver drove through a crowd during a celebration in #Nice. What critical times we truly live in. 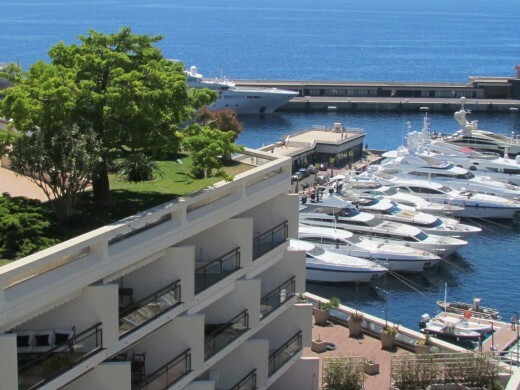 #Monte Carlo is in the Principality of Monaco. 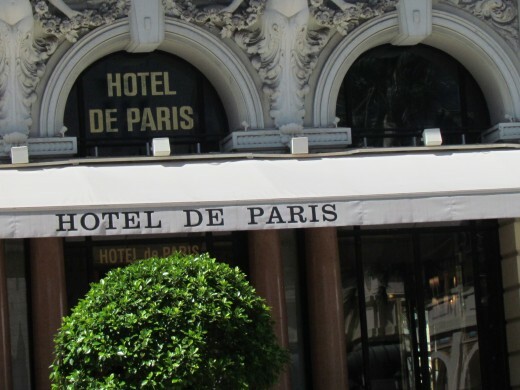 Spectacular shoreline views, Hotel de Paris, and the world-class casino is surrounded by a beautiful garden with top designer boutiques such as #Cartier, Prada, and Chanel. We walked in the Chanel boutique and was graciously greeted by well-dressed ladies and gents. Professional politeness rolled off their tongues which was followed by bright smiles. They explained that there was a second floor which we casually visited. There was an exquisite cape that was shown to me for a mere $2,000. I smiled and thanked the well-dressed saleslady to leave the cape where it was because we were there as tourist and nothing more. Videos of gorgeous models constantly played on screens throughout the store. The models marched forth dressed in winter styles. The saleswoman went on to explain that this was the winter collection. We thanked the distinguished ladies and gents as we humbly left the store. It was interesting to see where the wealthy shop. 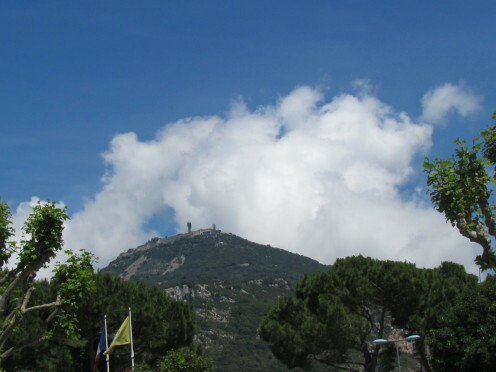 Wikipedia mentioned that "Monte Carlo (literally "Mount Charles") is situated on a prominent escarpment at the base of the Maritime Alps along the French Riviera. 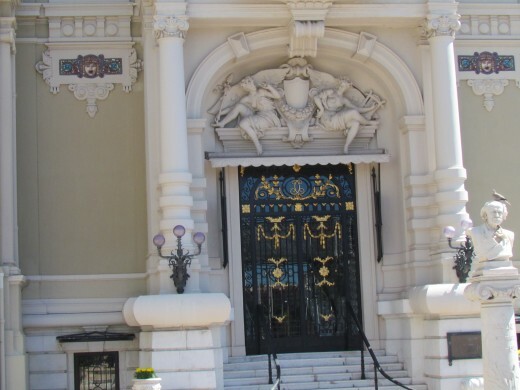 Near the western and of the quarter is the world-famous Place du Casino, the gambling center which has made Monte Carlo an international byword for the extravagant display and reckless dispersal of wealth.'" We do not gamble but visiting this area and seeing this impressive casino structure from the outside with its exquisite appearance was interesting. 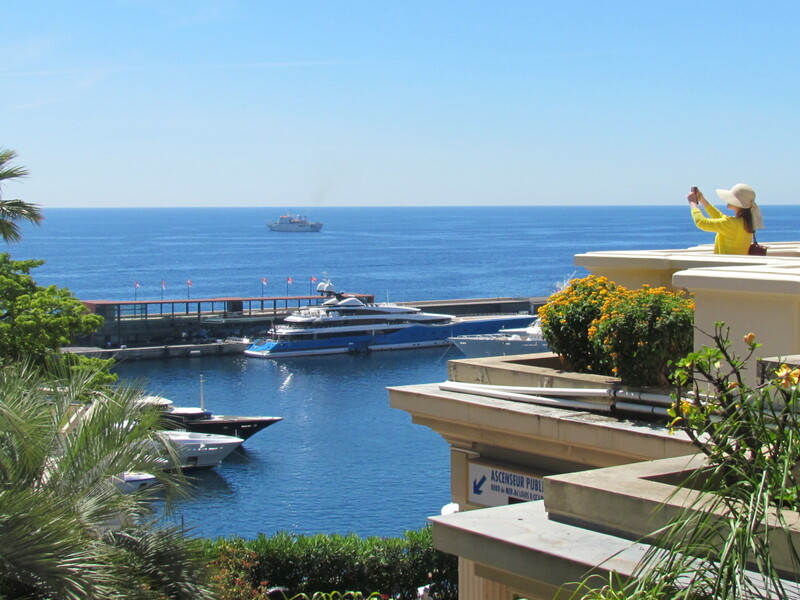 Our driver David, had given us an hour to walk around Monte Carlo and explore its sights and food. 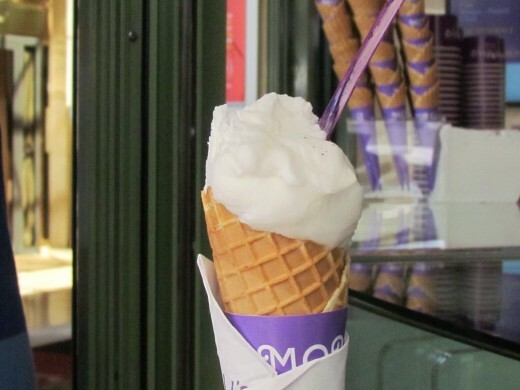 After going into this elegant restaurant to use its white marble bathrooms, we decided to get some delicious sherbet which exuded from a cone. It was refreshing on a hot day. 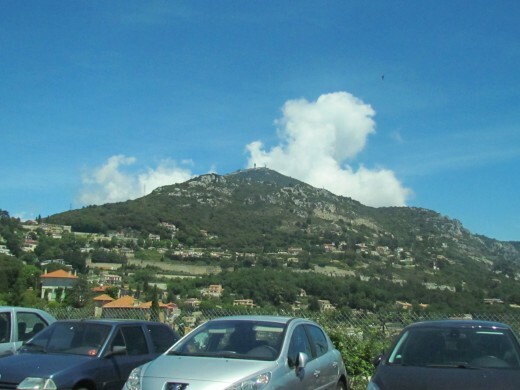 Now, it was time to return to our vehicle so that we could head over the Nice, France where we toured a perfume factory with scintillating smells that filled the air as we approached the building. Our tour guide at the facility talked about how perfume was made from a variety of flowers. She also suggested that the best way to protect your perfumes is to leave them in the original container or box they came in. Rather than purchase perfume at the factory, David, our driver suggested that we should purchase it at another shop downtown. 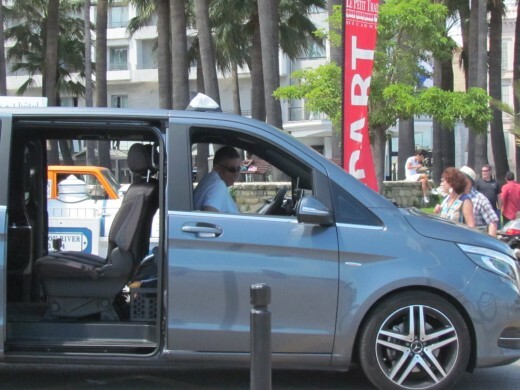 Our tour with David, as our driver throughout Eze and Monte Carlo, was compelling. 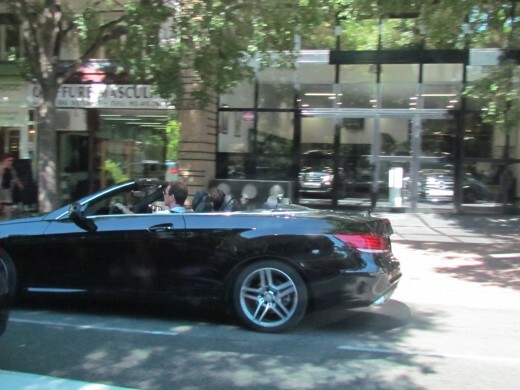 For four hours in a private, impeccably clean vehicle with the comforts of a limo, we paid about 150 Euros per person. 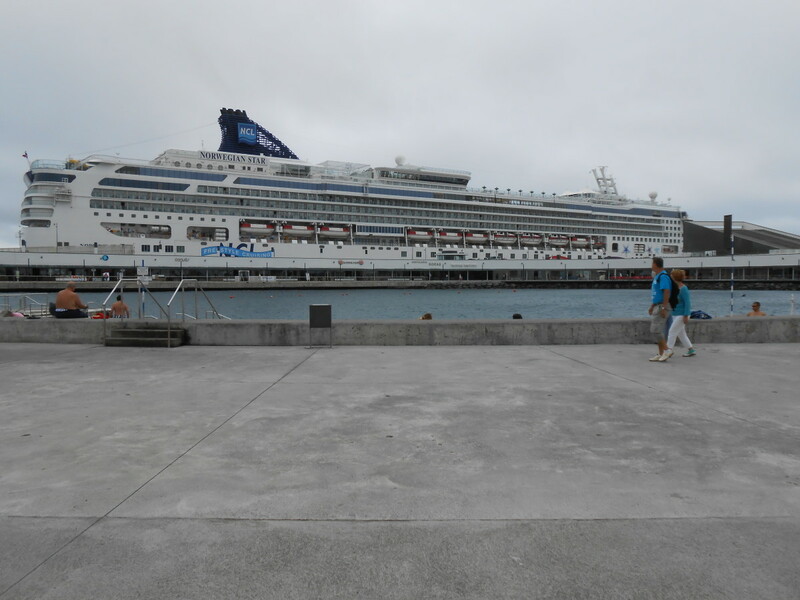 This excursion was purchased at the port once we got off the tender or shuttle that we came over on from the cruise line. 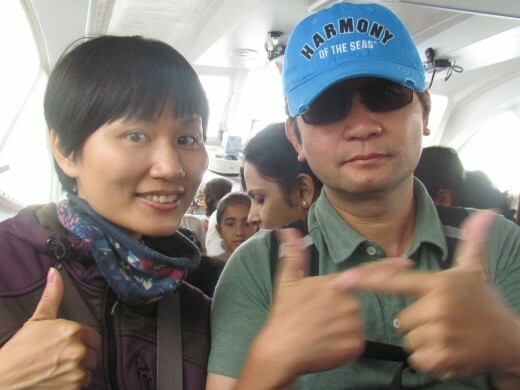 It was the best decision that we made because although we had booked this same tour through Shore Excursions Group, we missed our tour which seemed more rigid with restrictions on dress due to the visit of a religious or memorial site, where your knees and shoulders had to be covered. We realized that waiting until we arrived at some of these locations and just hire a taxi was cheaper than pre-booking our excursions. You have the privacy of your own vehicle and most drivers can serve as tour guides with an abundance of information about the areas. We enjoyed this excursion more than any other. 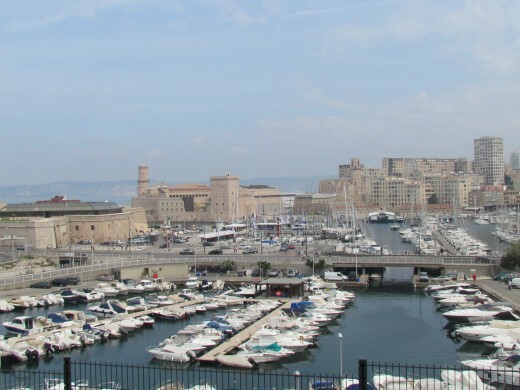 Marseille, France has magnificent scenery for tourist. 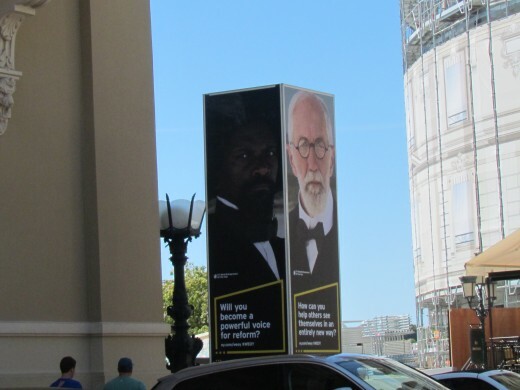 While traveling in Marseille, we saw our spiritual brothers and sisters. We got out of our vehicle and hugged along with customary kisses on each cheek. 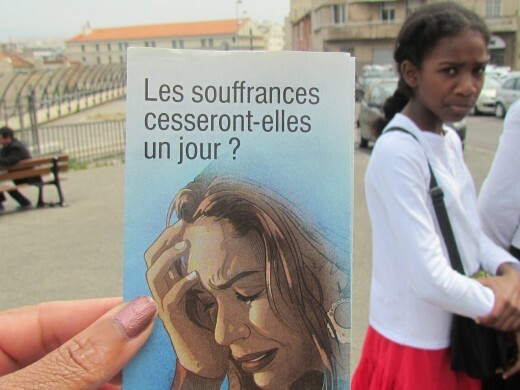 Jehovah's Witnesses, are truly a worldwide organization of all races who genuinely show love. Eventually, we left our brothers and sisters as they continued to focus on their lifesaving work. 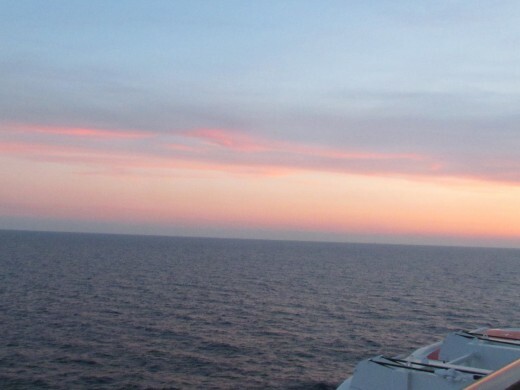 A beautiful sunset from the balcony of our stateroom. 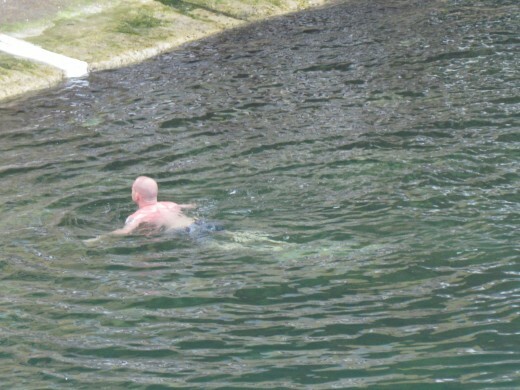 A man was swimming near the pier in Marseille, France. 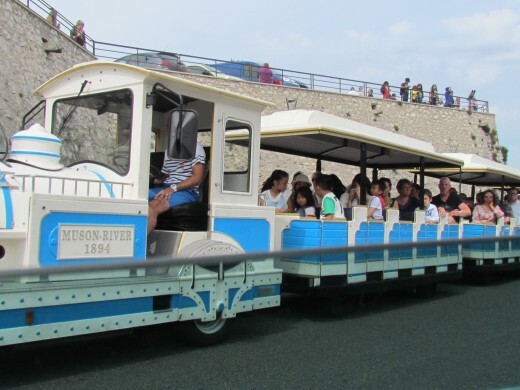 A small train used for the tourist in Marseille. The next location our driver stopped for us to see, more of our brothers and sisters were busy witnessing with various languages of literature. Our cab driver was amazed as we got out of the car running to hug and greet our brothers as well. One of the sisters displayed some of the languages such as Russian literature that they had available for tourists and residents. An historical monument that mentioned the various wars that affected their lives in the area of Marseille, France. Chateau d' If, was made famous by Alexander Dumas's classic 1840's novel Le Comte de Monte Cristo or the movie "The Count of Monte Cristo). 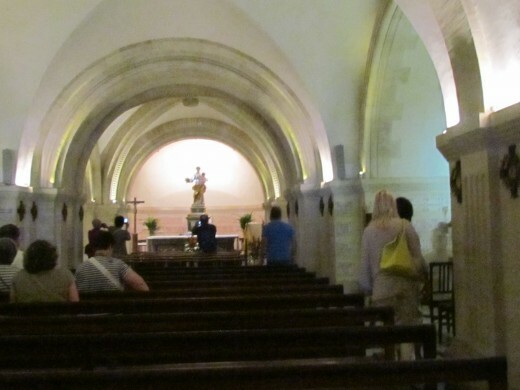 Inside of Notre Dame De La Garde, that was located on a mountain top overlooking the city. We sat on our balcony after we got dressed for dinner at the popular Moderno Restaurant which served Brazilian style food. It was absolutely delicious. 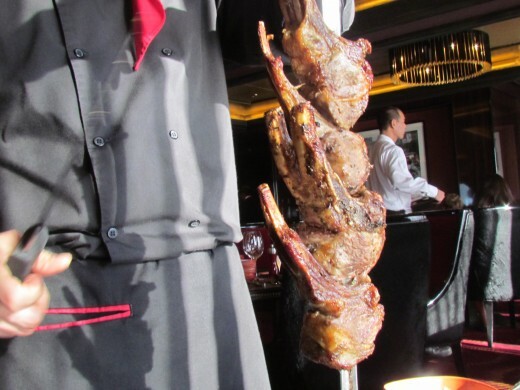 A variety of meats such as juicy lamb and steaks are delivered to your table as long as you continue to request the meats. From appetizers of wrapped shrimp in bacon to delicious sides of rice and pasta were served before your meats are delivered. 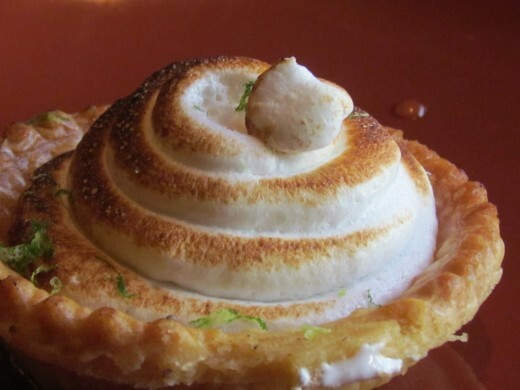 Dessert was this delightful lemon pie. 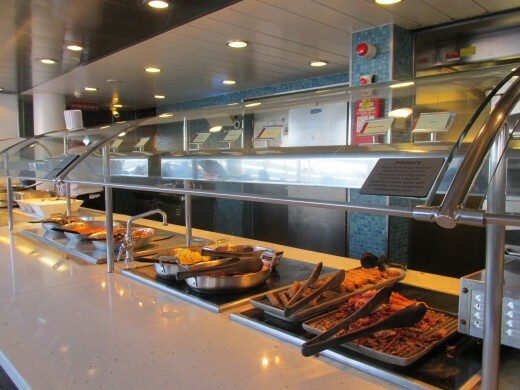 Teppanyaki, is a Japanese Restaurant on Deck 7 which we also enjoyed with friends. Our chef was quite entertaining as he prepared our orders. He sang, danced and used his artistic abilities to entertain us. I had the Bay Scallops at the Japanese Restaurant. They were delicious. 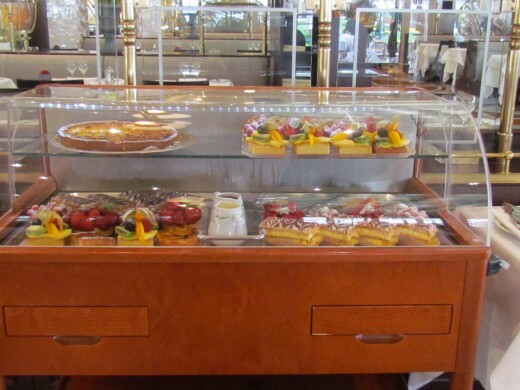 One of the buffets that was displayed for lunch on Deck 15 at Great Outdoor Buffet. They serve breakfast from 5:30-9:30 am. Then they prepare for lunch from 11:30 am - 3:00 pm. 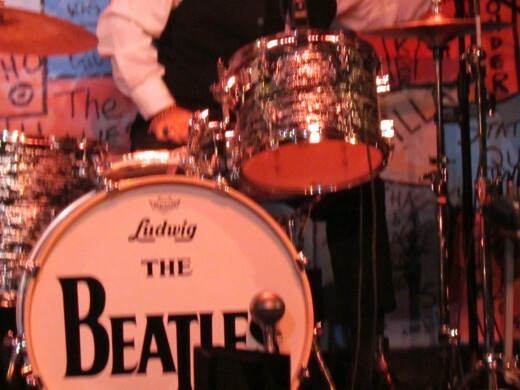 The Epic Beatles, were one of the performances that we attended at the Cavern Night Club. It was as if we had stepped back in time as we heard the similar voices of John, Paul, George and Ringo. This was the younger version of John Lennon, as they sang and referred to themselves with the same popular names as the original Beatles. It was an unique and exciting performance. 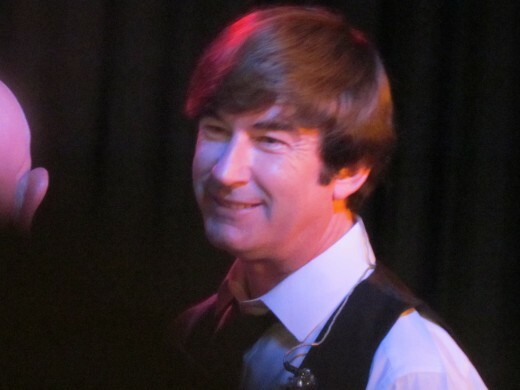 The Epic Beatles were outstanding as we sang along and took photos. 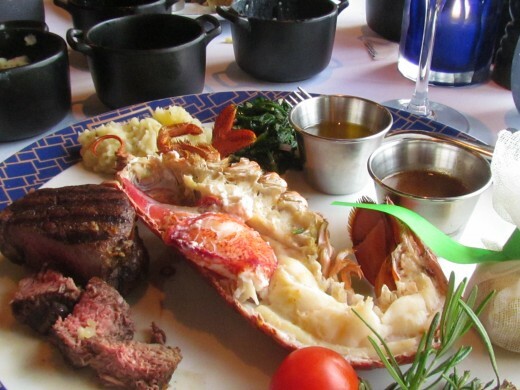 One of the amazing surf & turf meals we had at the specialty restaurants for no additional charge. 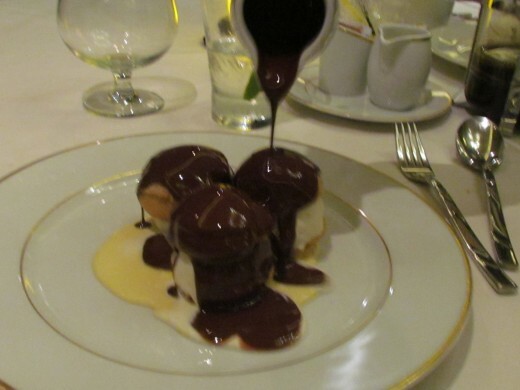 A delectable dessert that we experienced during our cruise. Yes, we ate quite well without additional payments. The movie "Skyfall" was shown on the 15th Deck. 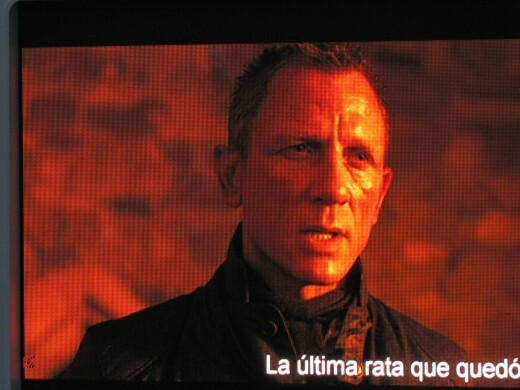 Daniel Craig, was still handsome on the big screen of Epic. 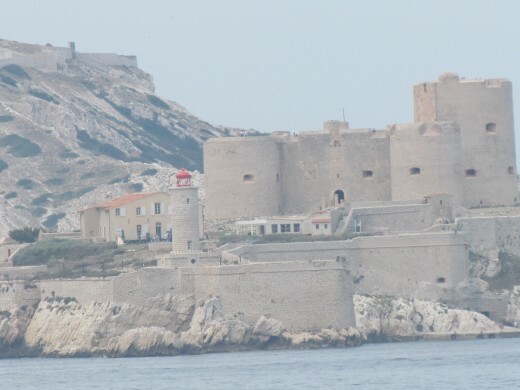 A view of Chateau d If, where the movie "Monte Cristo" was filmed. 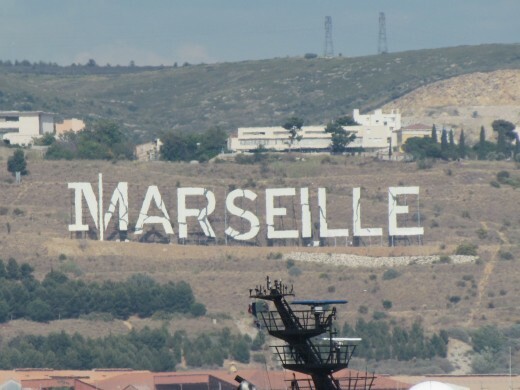 We could see this sign of Marseille from our balcony when we arrived in the port. A market filled with various items that we could purchase such as fancy soaps, perfumes and handbags were outside the ship on Saturday in Marseille. One of the couples who performed in the Broadway version of "Burn The Floor." This performance was outstanding. We arrived in the last port of call on Saturday which was Marseille (Providence), France. Once we left the ship, taxi cabs were available through cruise staff members. For a total of 50 Euros, we had a personal driver from the area who gave us a guided tour for two hours. More than five minutes into our trip, we stopped for a quick photo. 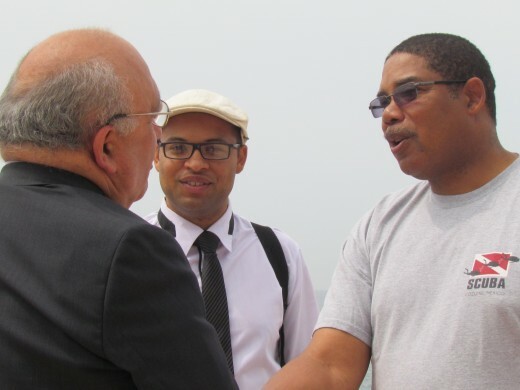 With tremendous excitement, we greeted our brothers and sisters in Marseille, France. Our driver was amazed that we knew people there. 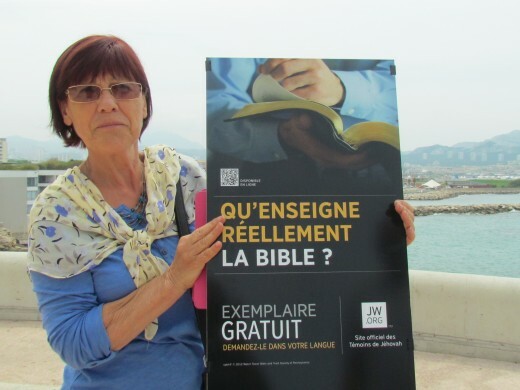 We explained that Jehovah's Witnesses are all over the world. No matter where we go in the world, we are brothers and sister who love each other because of the teachings from God's word the Bible from our Heavenly Father. After hugs and cheek to cheek kisses, we returned to our taxi and headed up to Notre-Dame de la Garde. 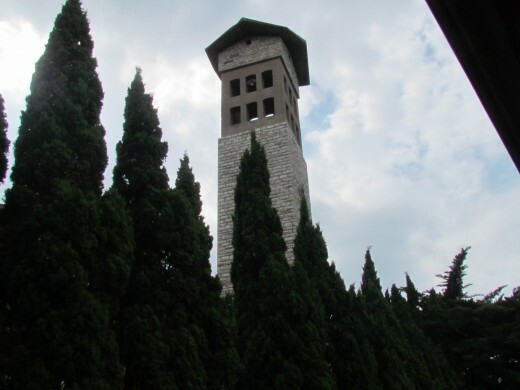 It was situated on a mountaintop that grandly overlooks the city. Numerous visitors were at this location so we did not stay very long. 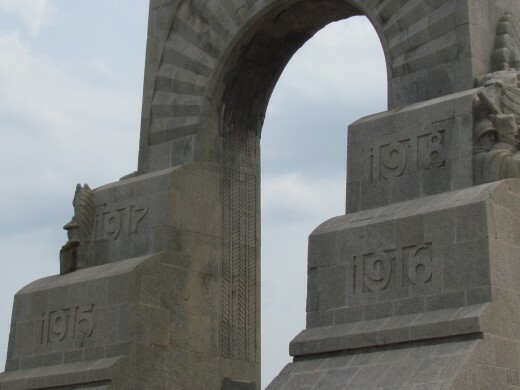 This unique and exotic city has an amazing source of history. 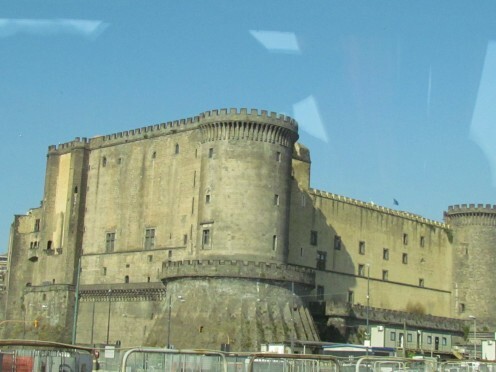 "Marseille's answer to Alcatraz, this brooding Island-fortress-prison has hosted victims of religious persecution, anti-royalists, revolutionaries and Alexander Dumas (fictional) hero, the #Count of Monte Cristo. 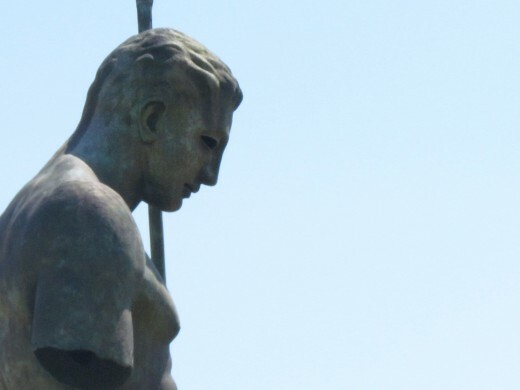 Very often adapted for film and television, it tells of Edmond Dantes, a sailor unjustly accused of treason on the eve of his wedding and held up for 14 years before becoming the only inmate to escape by swimming across to the city. Today, his exploit inspires an annual swimming race, the Monte Cristo Challenge. 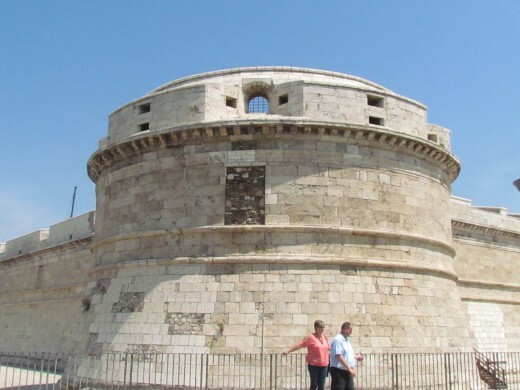 In 1890 the prison was closed and the Island opened to the public." Marseille became a part of France in 1481, "but the city retained in theory the right to provide her own defense. The new Chateau was too many people an unwelcome reminder of royal, Parisian authority. This was a dark period of history for Marseille, France. 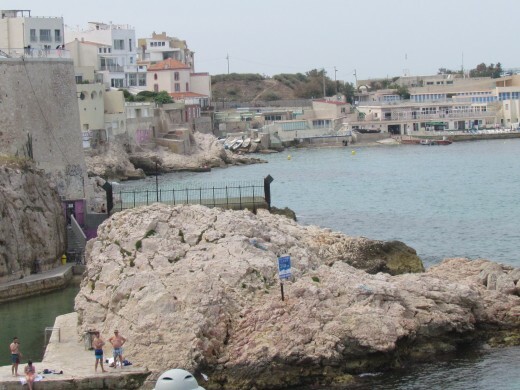 Today, this Mediterranean city, "...is the country's second largest city, after Paris, with a population of 852,516 in 2012, . . . Marseille was the most important trading center in the region and the main commercial port of the French Empire," stated Wikipedia. 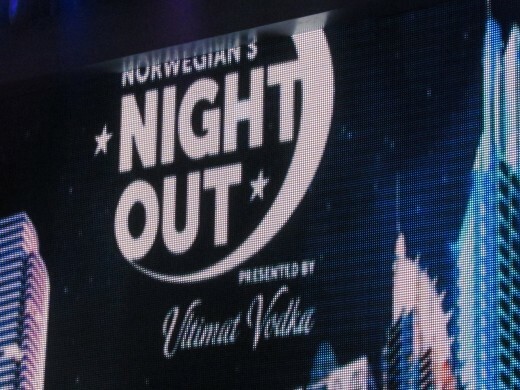 Pitbull's, video for Norwegian Cruise Line entitle, "Freedom," featured on YouTube. 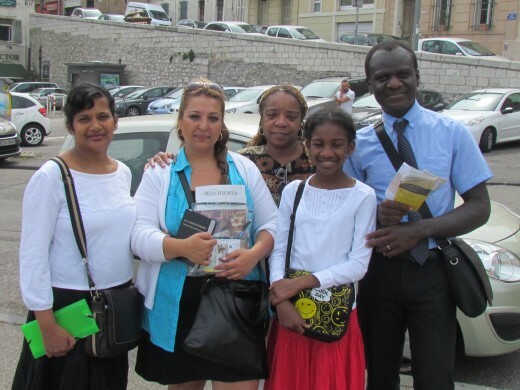 Our first tour in Naples, Italy was memorable. A ship in the waters of Barcelona, Spain before we left the port. 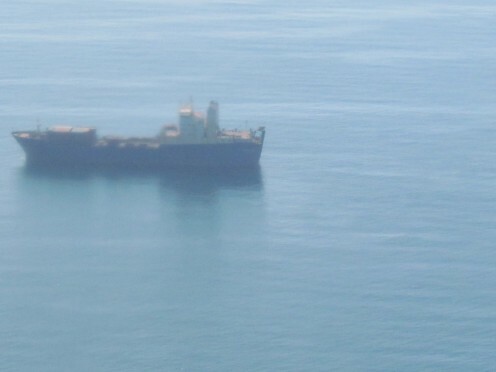 A photo near Civitavecchia, Italy. 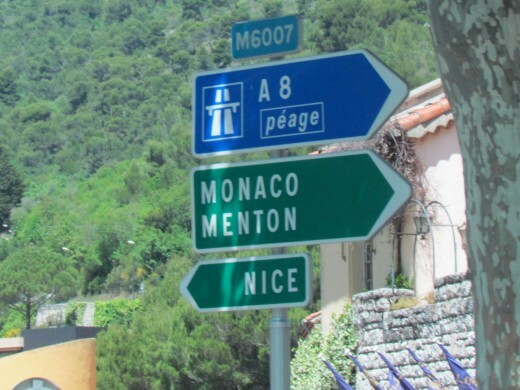 The magnificent Nice, France and Monte Carlo area. 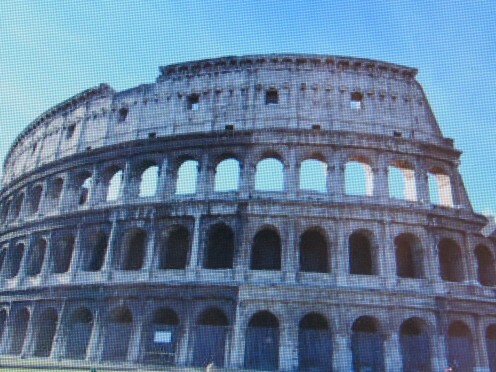 Rome and The Colosseum. 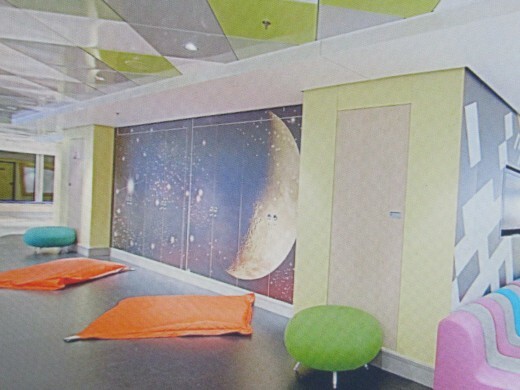 Photo is from the website. 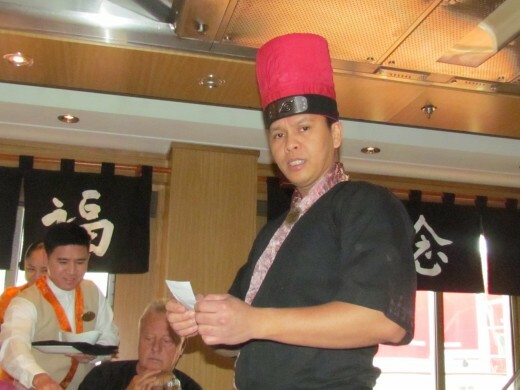 During our Epic cruise on Norwegian, delicious food was served and top entertainment was presented. Such performances as #The Epic Beatles, Piano Bar Music with Ian West, Burn The Floor, The Supreme Dream Girls, Priscilla Queen of the Desert, Howl at the Moon, Cirque Dreams & Dinner. 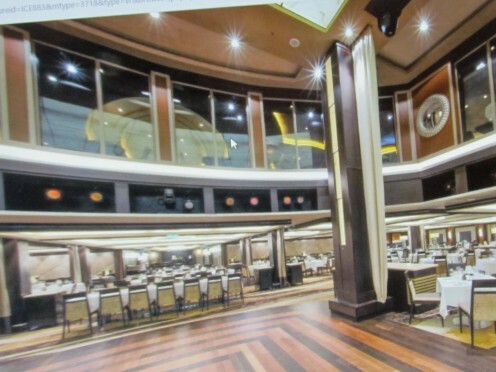 Other activities included Open Mic Karaoke, Late Night Dance Party Music with our DJ, The Perfect Couple Game Show, Deal or No Deal Game Show and numerous shopping facilities within the ship. 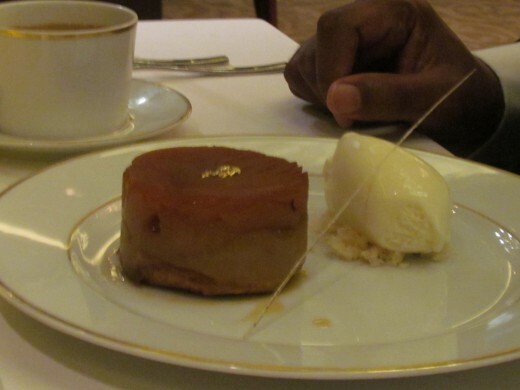 Some of the best five-star specialty restaurants. Many tourists acknowledged that this was their first time on the Epic and they had not been to this part of the Mediterranean before. 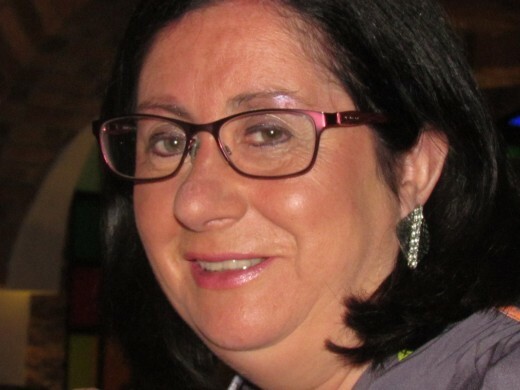 Ann, from #Scotland, said, "This is the best cruise I have ever been on." We totally agree with Ann. Our appreciation and respect for the earth should constantly be exhibited through recognition of creation, thanksgiving, and prayer to God. How thankful we are to have had this experience. Good job Norwegian Cruise Line! A 29th Wedding Anniversary ~ Has It Really Been That Many Years? I totally understand and that is why we have to be in constant prayer for each other. Why our religious beliefs, race, culture or skin color has become such an issue. This inspires hatred within humankind. Keep the faith and remain strong during these difficult times. I did notice and I've just been watching some of the footage from the remembrance things that are going on there at the moment. I think the whole world in is shock but the best way to sum it up is what a Young Muslim guy ho lost his sister there said. "It's not Muslims doing this, my sister was Muslim and she was killed"
I can imagine the horror you felt when hearing the news, I feel the same when I hear about things going on in Istanbul. Thanks again for your comment. If you noticed, we visited that exact area where the terrorist killed more than 84 people by driving a truck through the crowd. 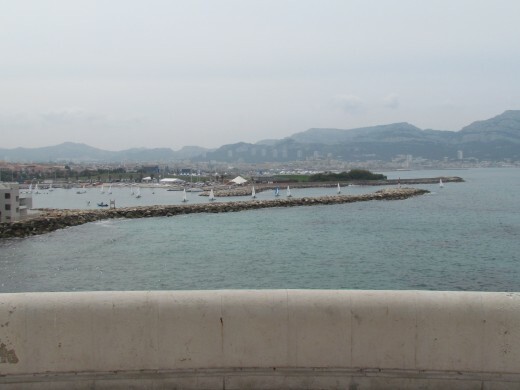 I was devastated when I heard that because Nice, France was one of our favorite locations we toured. The view in that area was spectacular. The appearance of water was an amazing crystal blue. It was right before we went into the area of Monte Carlo. How sad that a world so beautiful must be marred with such violence, death and destruction. May each of us keep our family, friends and enemies in our prayers. Really enjoyed this hub. I've traveled the Eastern Med a few times but not the Western side so this was really good to read. It was an interesting cruise. I would love to go again. It was amazing! My husband and I enjoyed everything about this cruise. It was worth every penny that we spent. 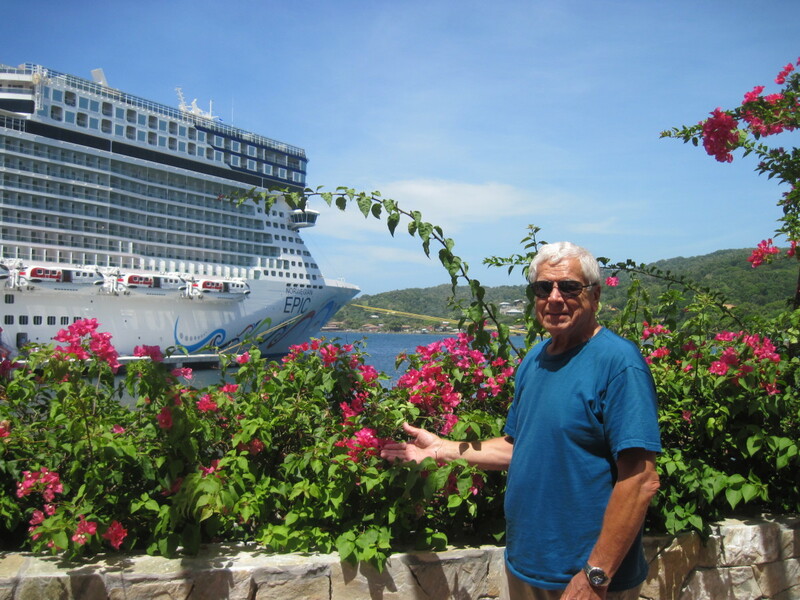 The ports of call were amazing, especially when you go for your own private tours. We have been on quite a few cruises but this was the best one that we have ever been on. 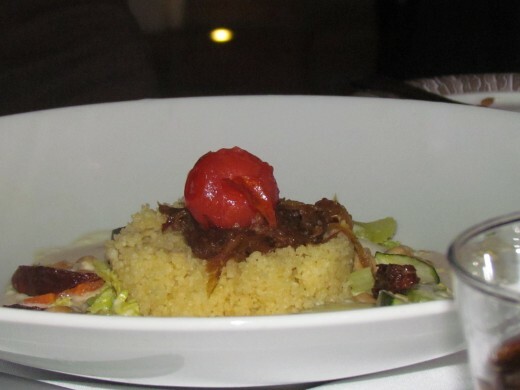 The food was outstanding at the specialty restaurants. To have the freedom to eat and receive free drinks at no extra cost was wonderful. We hadn't been on a cruise for a few yeas because we really were bored with the cheaper cruises. We just did not want to go just to be going. Most of the ports on those cruises, we had already been to. We decided to just put away some savings and take a different type of cruise. I am so thankful that we did. I would highly recommend this cruise because it was really worth every penny that we spent. Thanks again for your opinion. Sounds like a very interesting cruise with good food and good people..